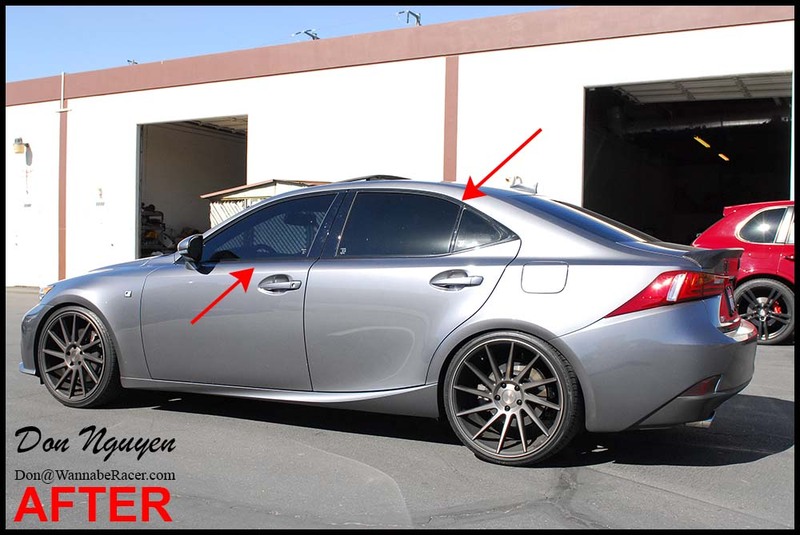 Let me know if you guys have any questions or if you are interested in getting some work done. 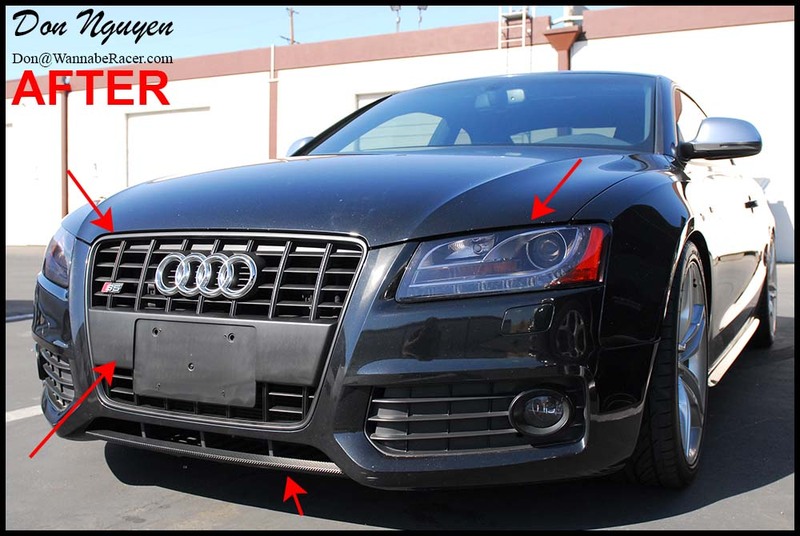 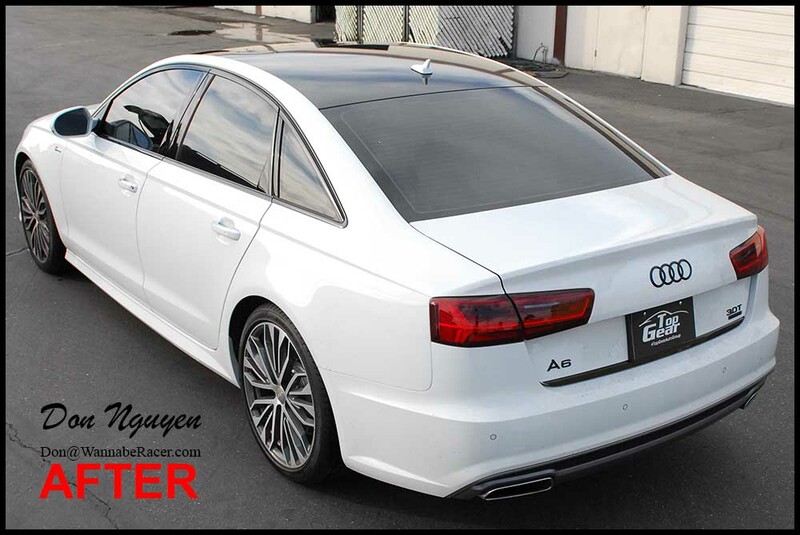 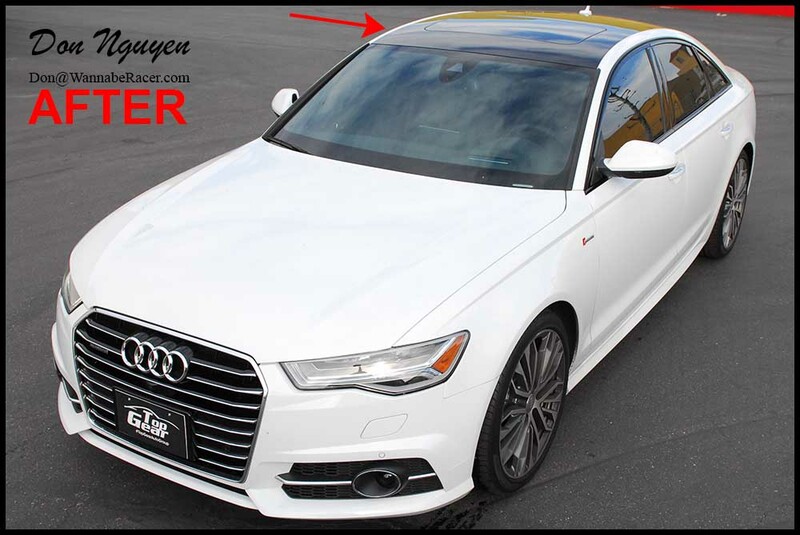 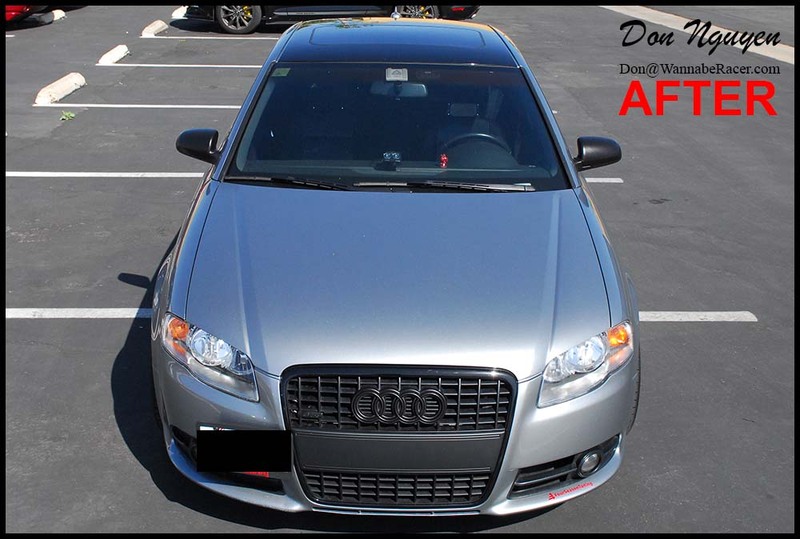 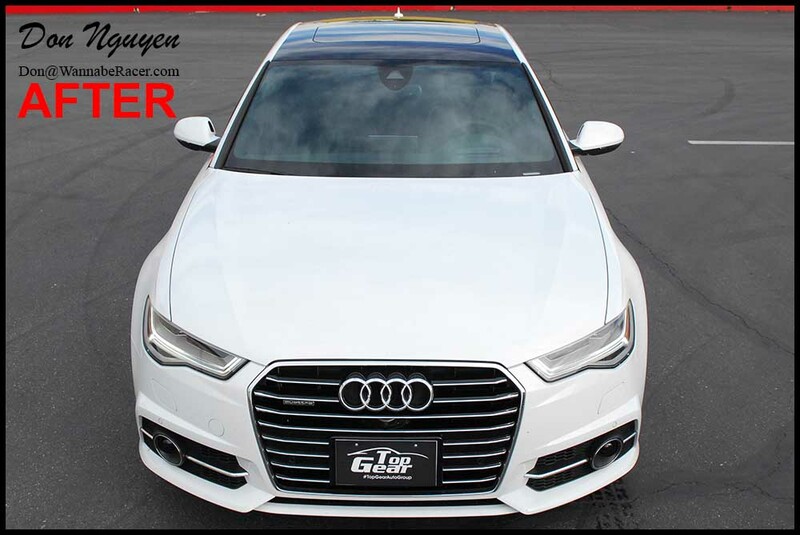 The owner of this white Audi A6 sedan came by my shop in Anaheim Hills / Orange County to have his roof wrapped in gloss black, black out his chrome window trim with gloss black to match the roof and also black out the rear badges with plasti dip. 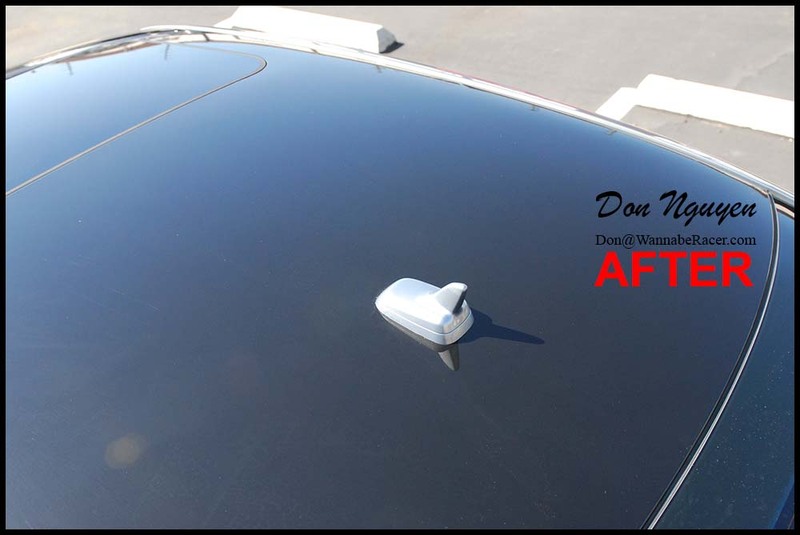 I had some people ask for some close up pictures of the plasti dip work that I do and also the edges of the roof where the wrap ends. 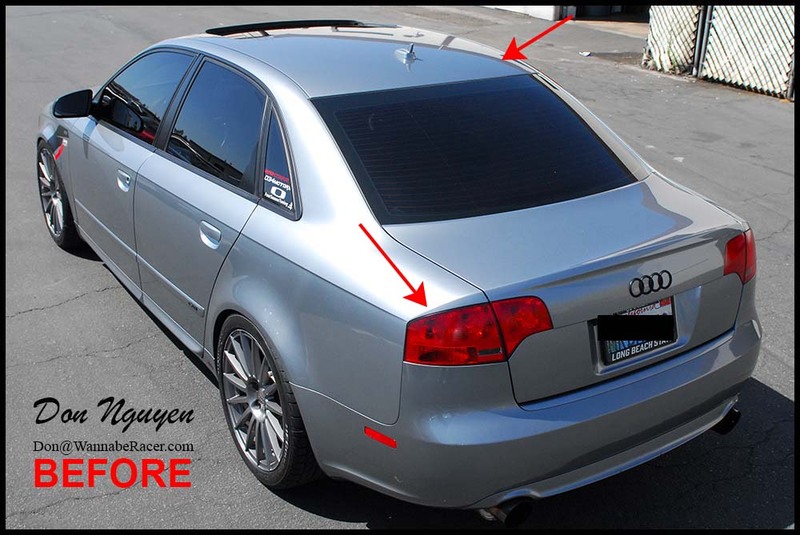 The Audi doesn’t have traditional roof rails like most other cars to allow the vinyl to tuck into, but it is not an issue with my wraps and I am able to get the body line of the car to transition to the vinyled roof fairly well still. 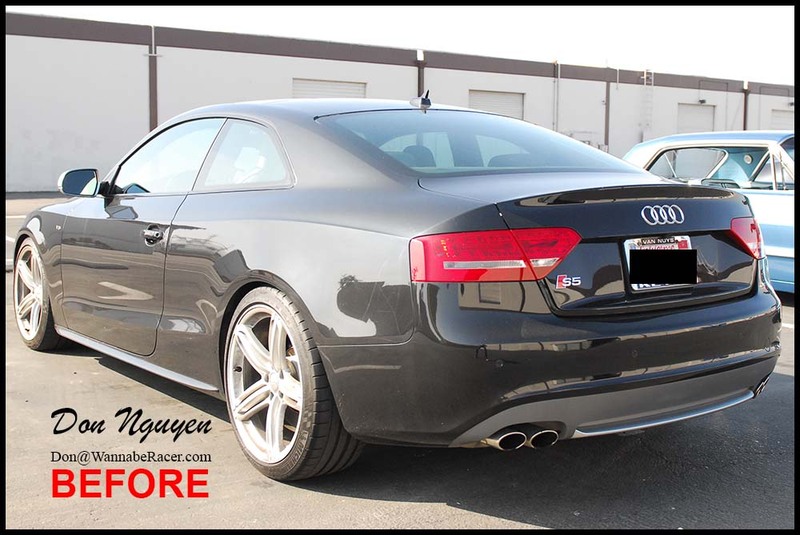 I lightly tinted / smoked the tail lights on this black Audi S5 coupe. 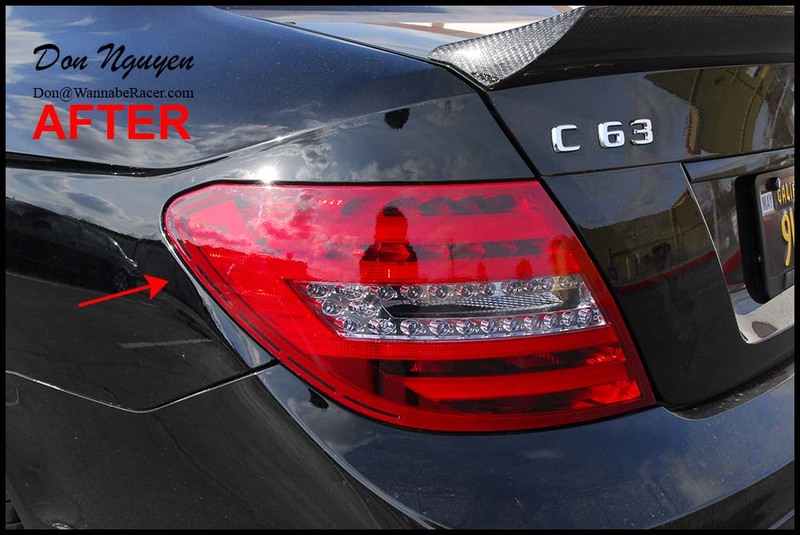 I tried to take pictures of the tail lights at various angles and lighting, to help give you guys a better idea of how the tint film changes depending on how the light is hitting it. 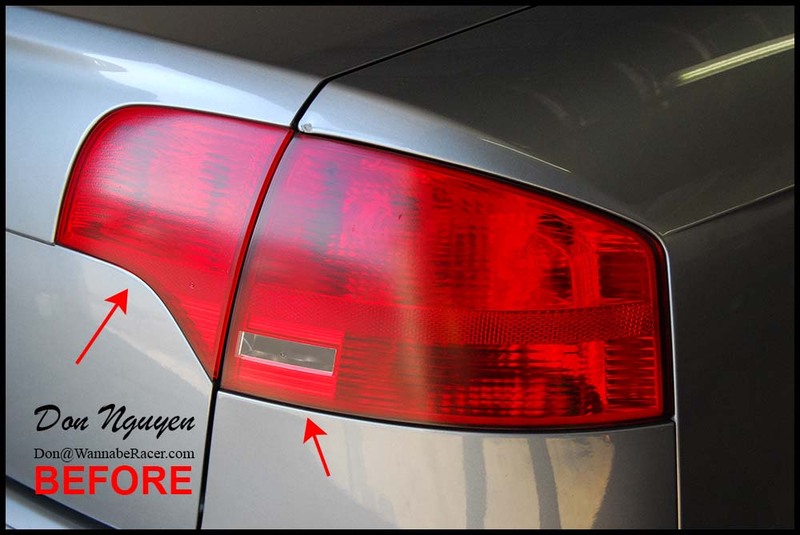 The light shade gives the car a fairly factory / OEM look still, but a nice noticeable change in overall look of the car. 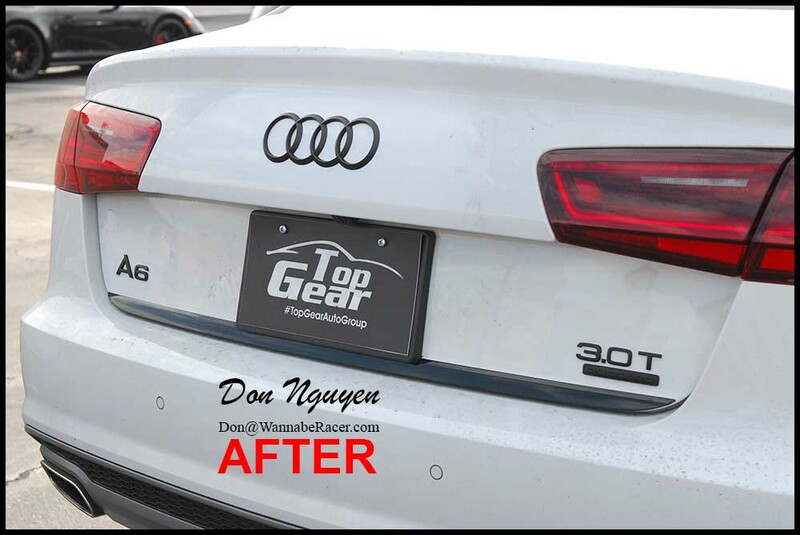 The film that I use is designed to mimic the look of how some cars come from the factory with already slightly darker tail lights nowadays. 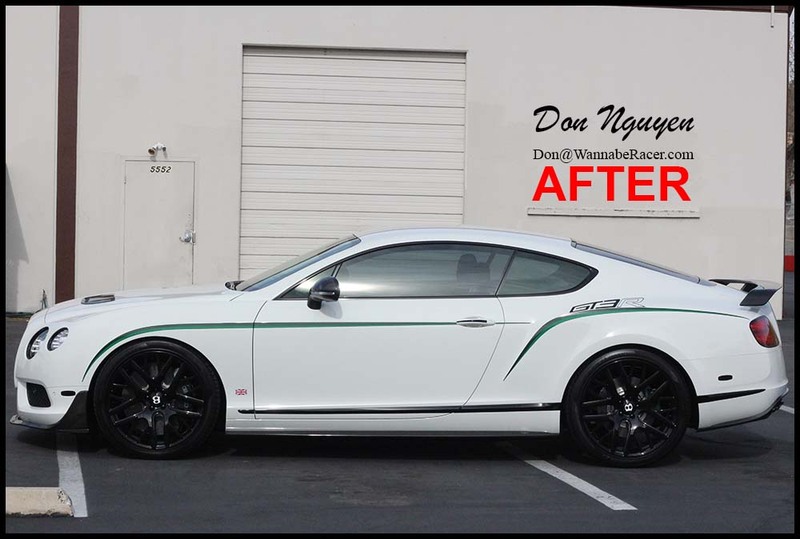 The owner of this car came out to me in Anaheim Hills / Orange County from Pasadena to have the vinyl wrap work done. 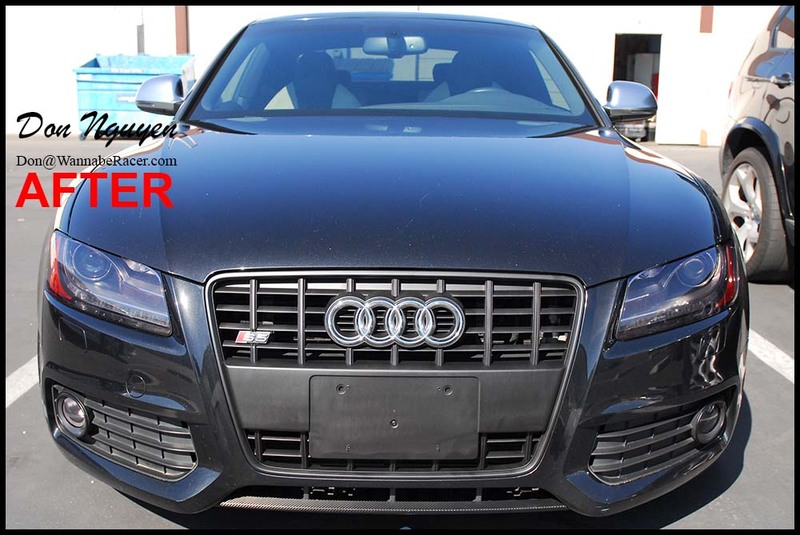 For this black Audi S5 coupe, I lightly smoked / tinted the head lights, wrapped the lower center bumper lip in the 3M 1080 gloss carbon fiber, and I plasti dipped the entire grill in a matte black finish. 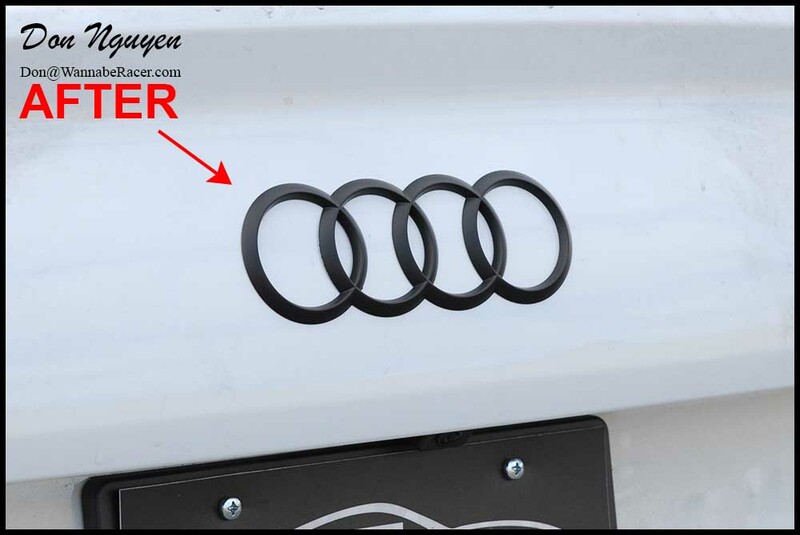 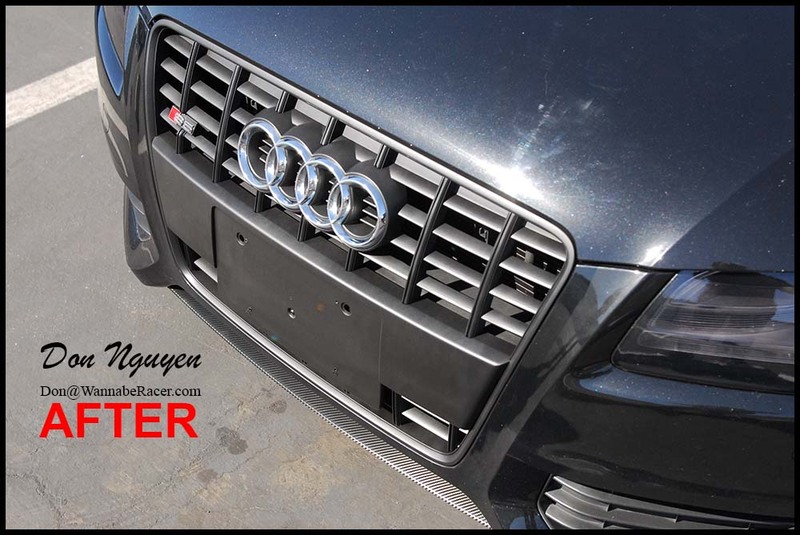 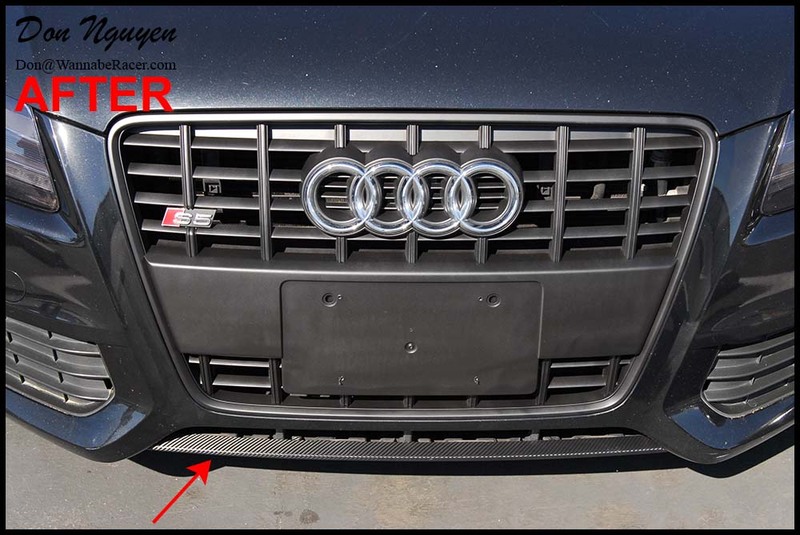 We did keep the chrome rings on the front and also the S5 badge in the grill their original finish/colors. 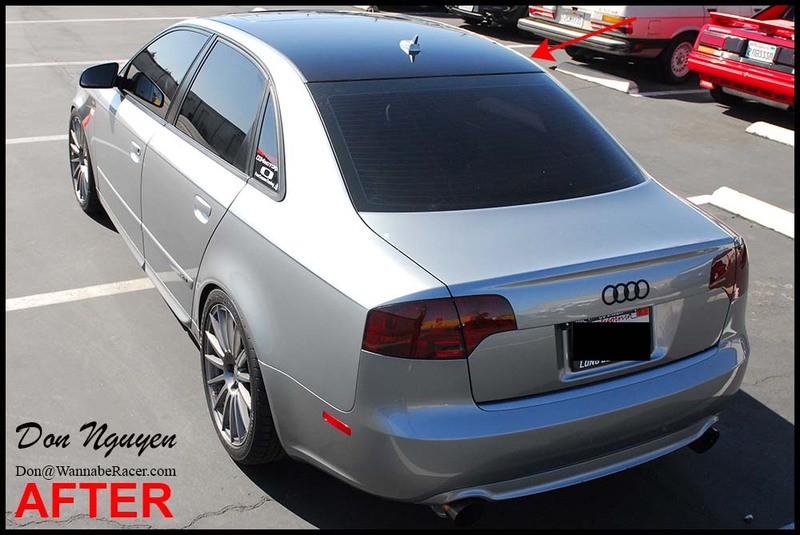 The owner of this car came out to me in Anaheim Hils / Orange County from San Diego to get the vinyl and plasti dip work done. 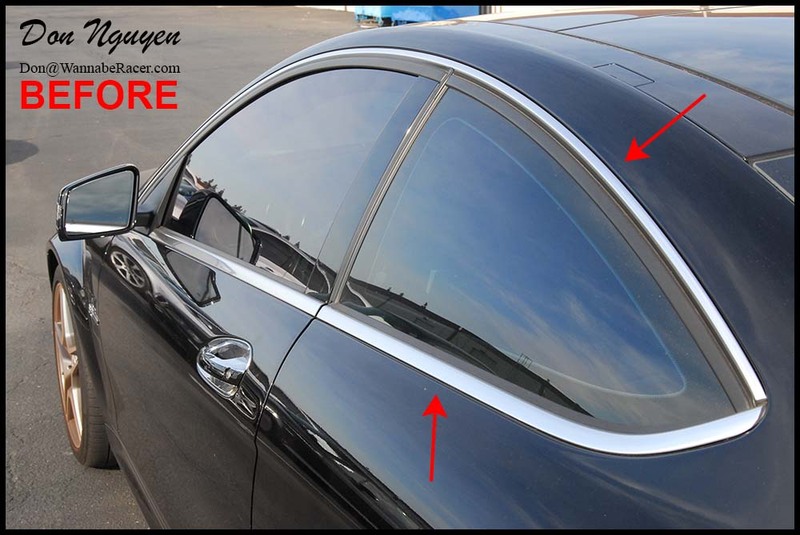 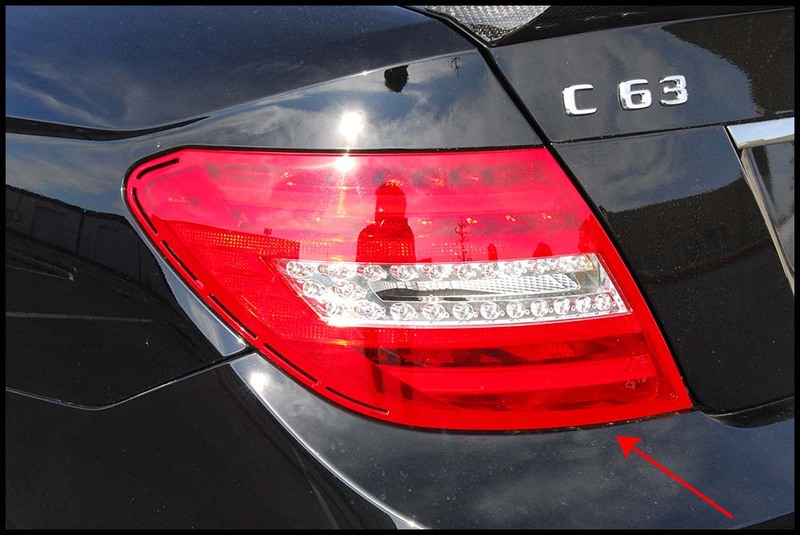 People are sometimes worried that the tint on head lights will reduce light out put, but the shade is fairly light, so that the light output is essentially unaffected. 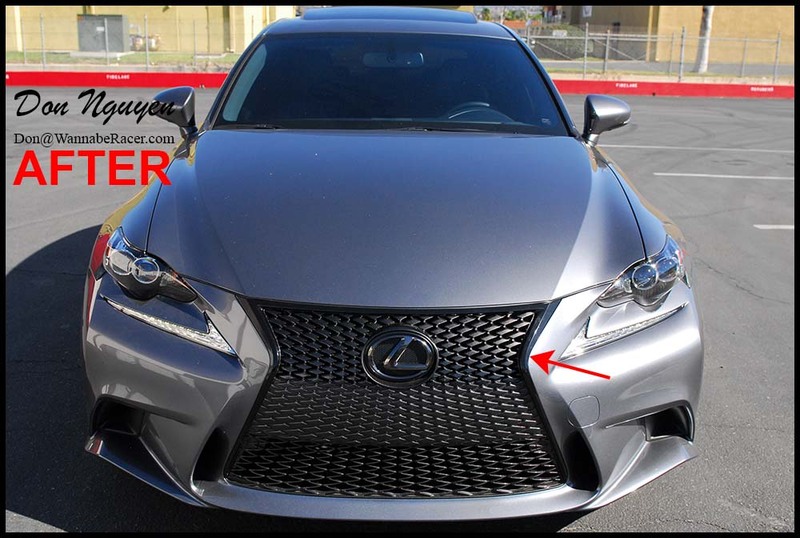 The additional benefit of wrapping the head lights is the protection they provide from rock chips and also helps prevent it from fading/oxidizing. 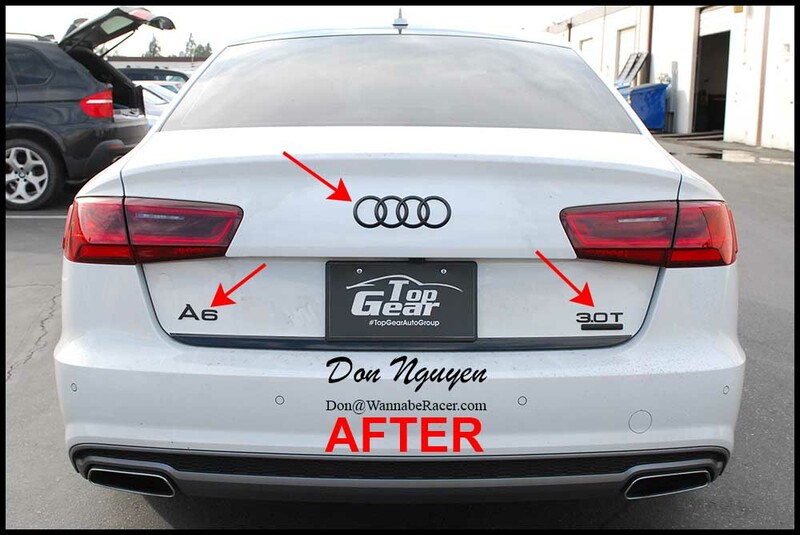 Last edited by Don Nguyen; 05-21-2016 at 08:00 AM. 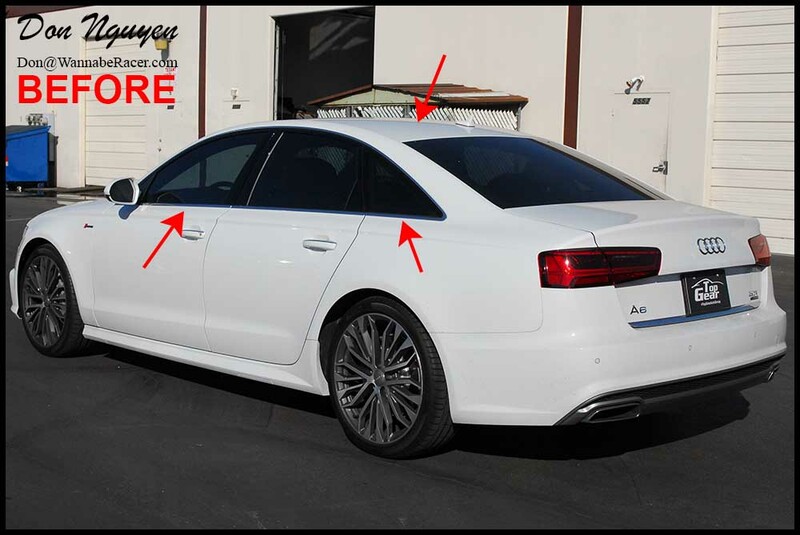 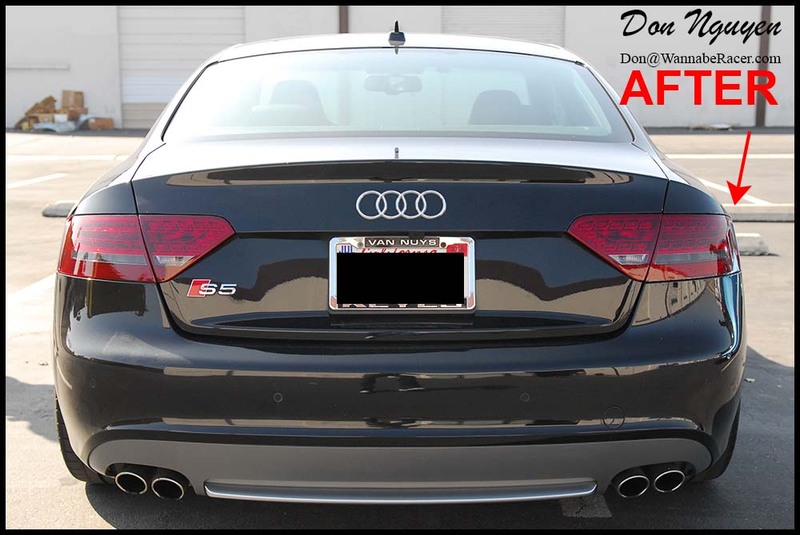 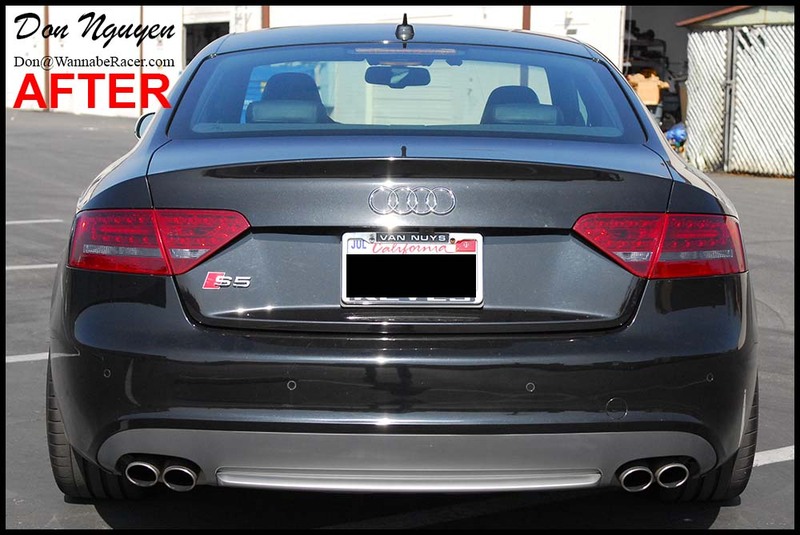 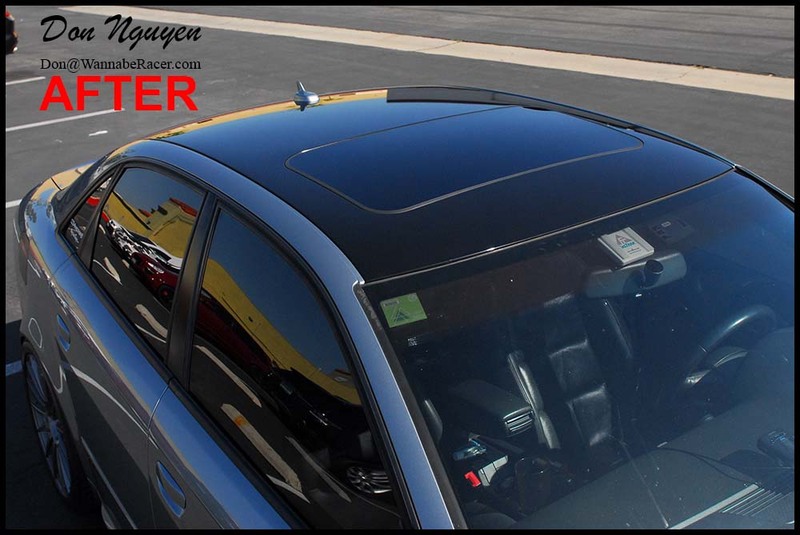 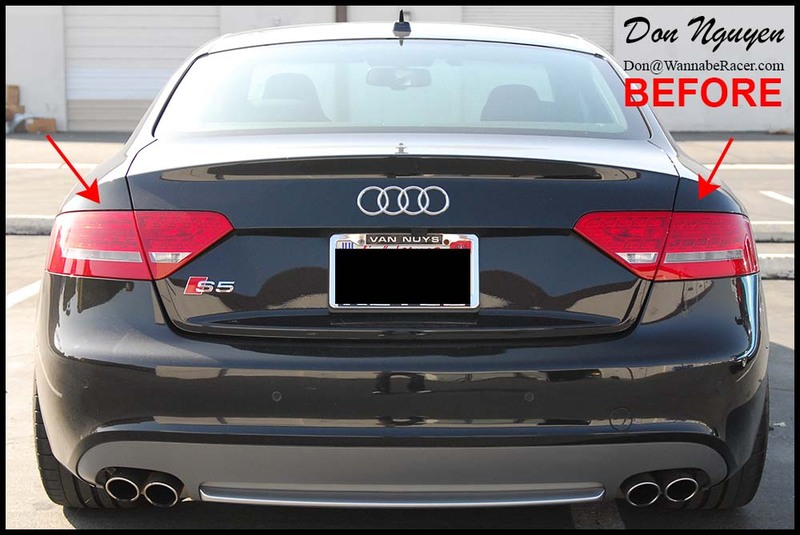 For this Audi A4 B7 Sedan, we wrapped the roof of his car in my gloss black vinyl material and also lightly tinted / smoked the tail lights on the car. 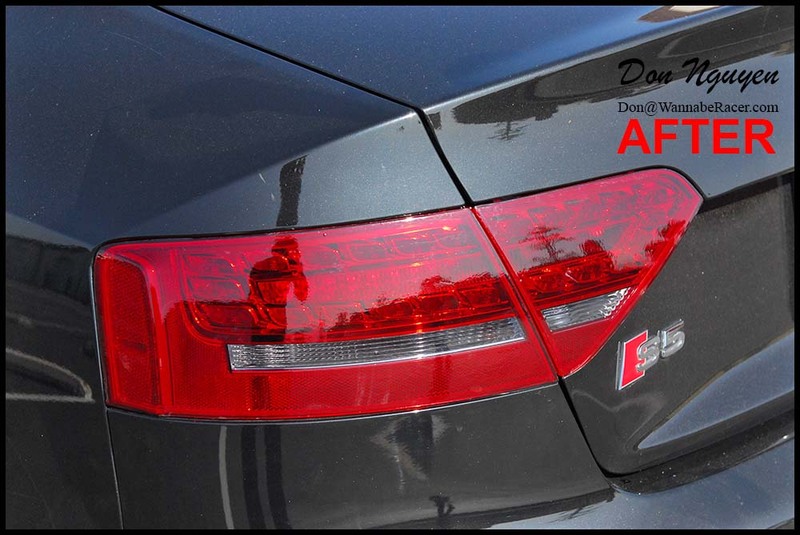 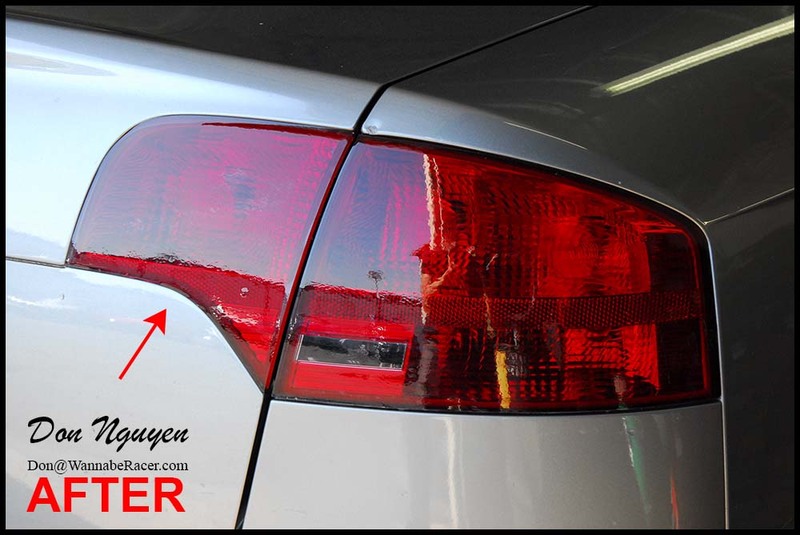 The tail lights were actually fairly dull and almost a matte finish before wrapping them, which can be seen in one of the close up pictures of the rear tail light. 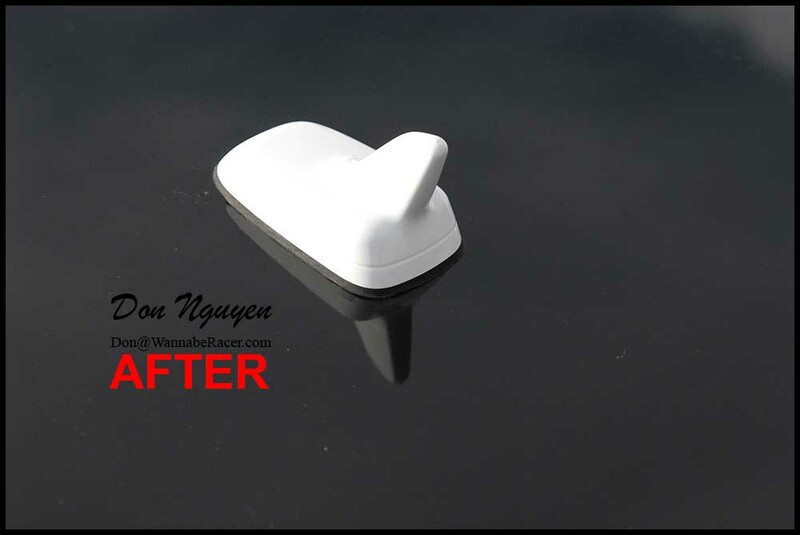 However, I was able to bring life back into them again and make them possibly even glossier / shinier than they were brand new from the factory. 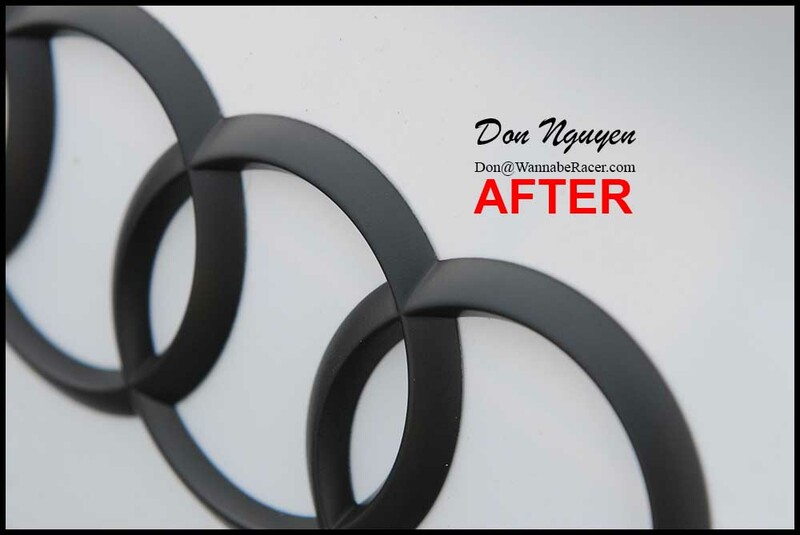 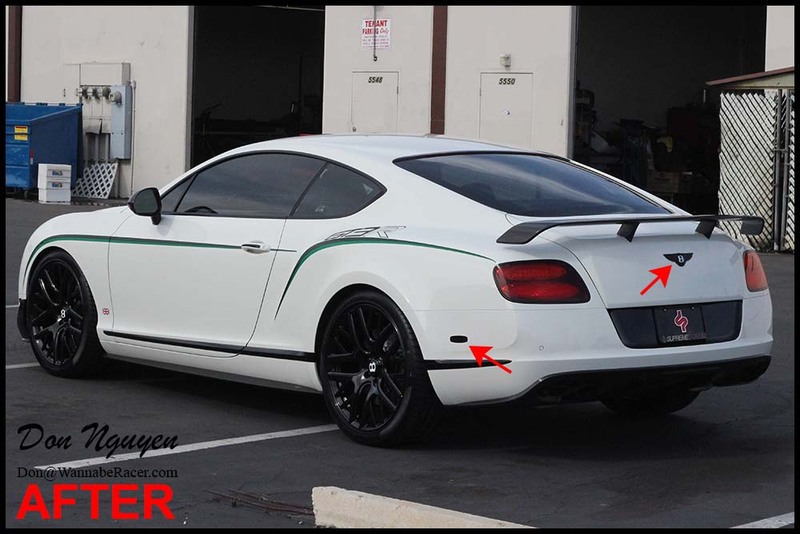 So even for those who are not looking to necessarily change the look of their car up, I am also able to vinyl wrap certain pieces/parts on the car to help restore certain faded/oxidized finishes. 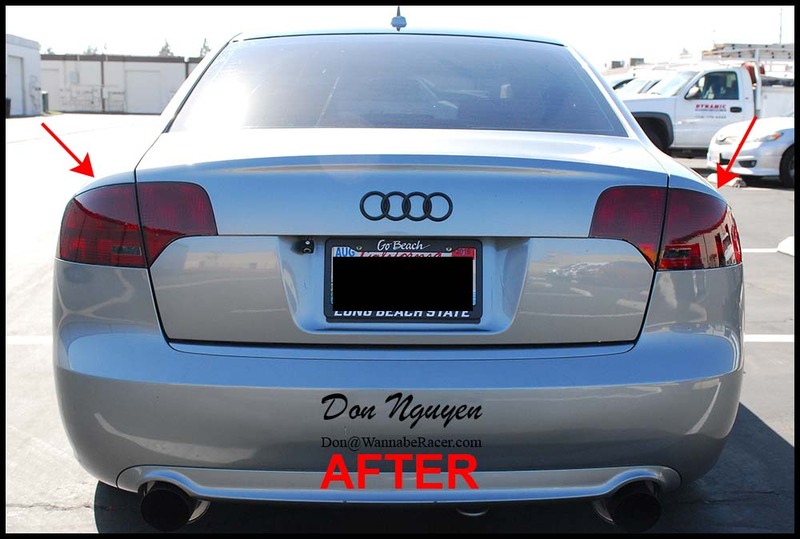 The owner of this car was from Fullerton brought his car to me in Anaheim Hills / Orange County to have the vinyl work done. 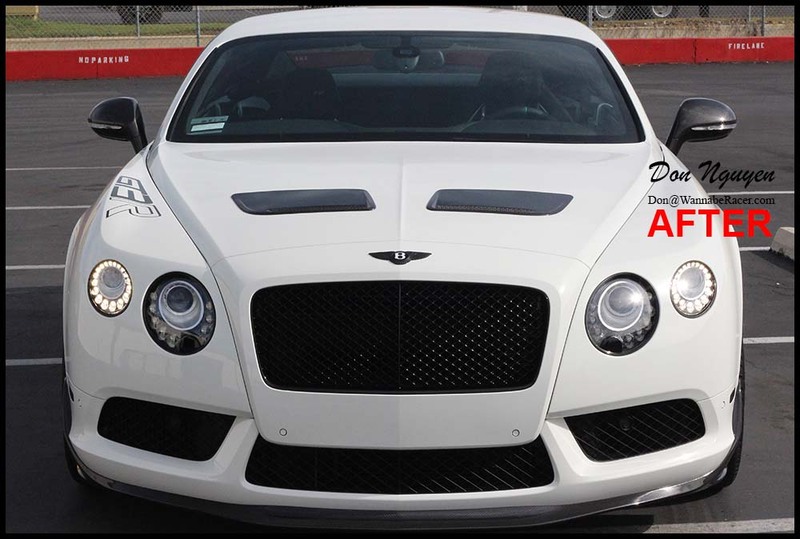 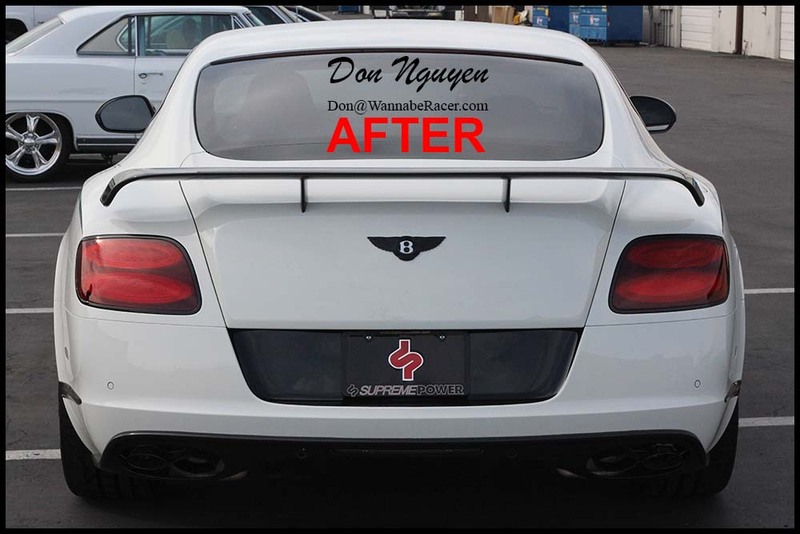 This white 2016 Bentley Continental GT3R came in to have me black out the chrome badges / emblems on the trunk and hood of the car. 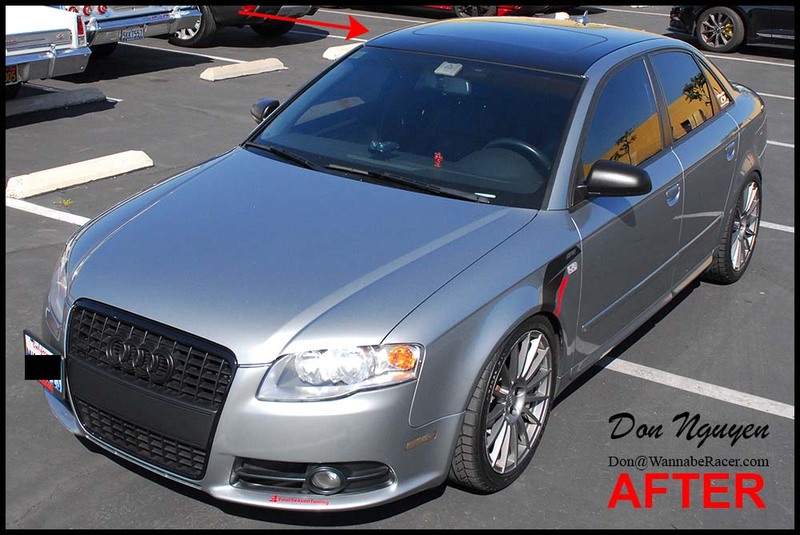 I also ended up blacking out the red and amber reflectors on the front and back bumpers of the car. 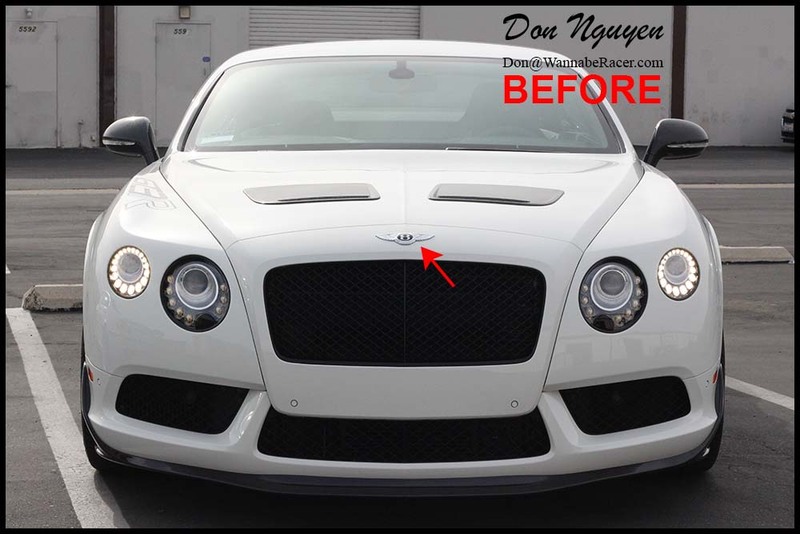 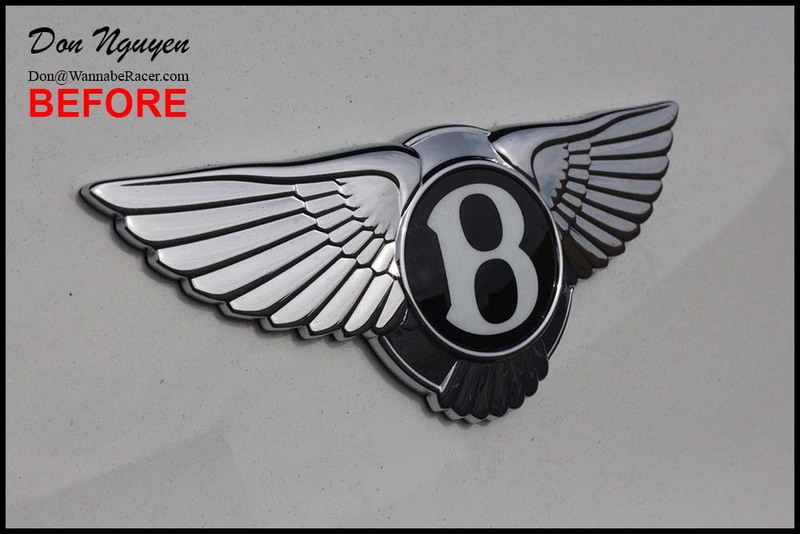 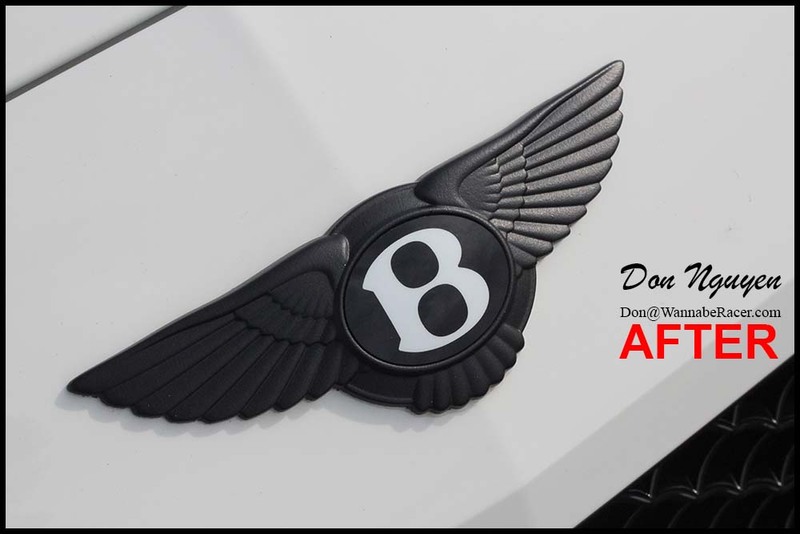 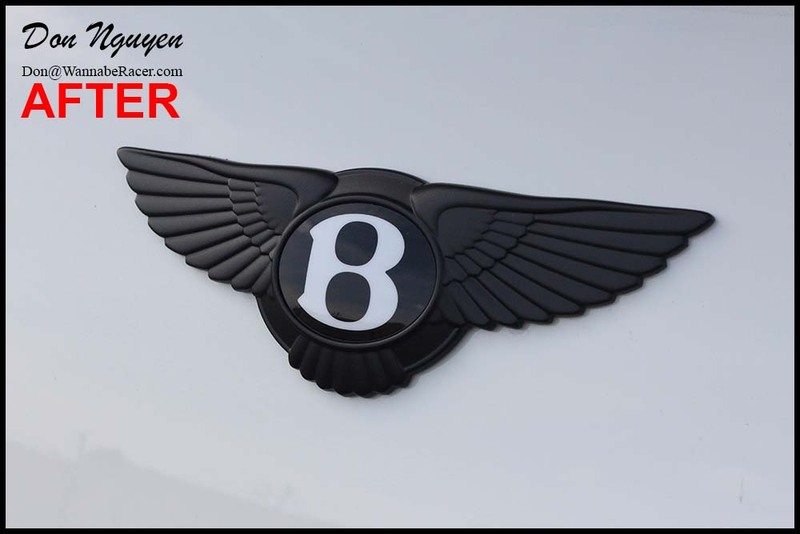 Sometimes small subtle changes such as the work I did for this Bentley is all a car needs. 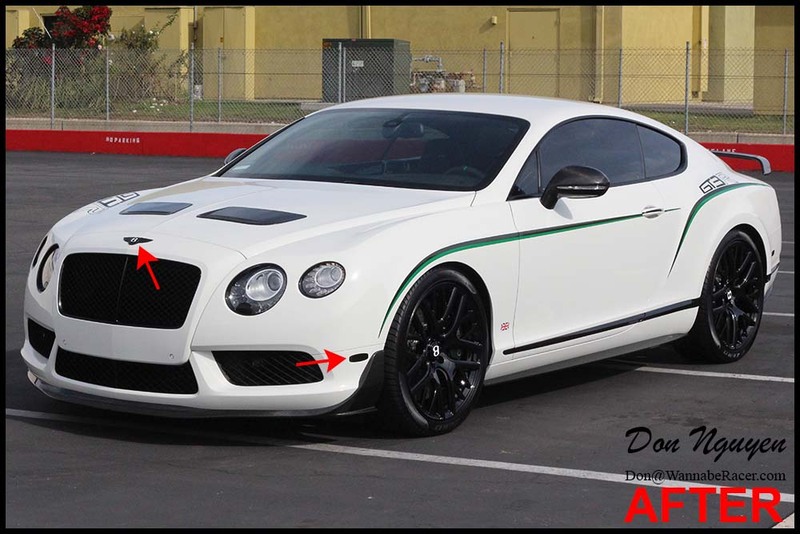 The owner of this car was from Los Angeles and came out to me in Anaheim Hills / Orange County to have the vinyl car wrap work done. 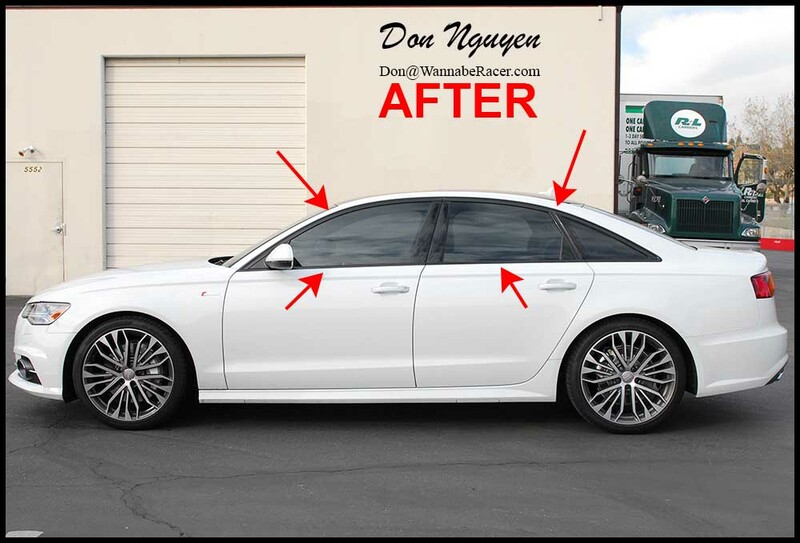 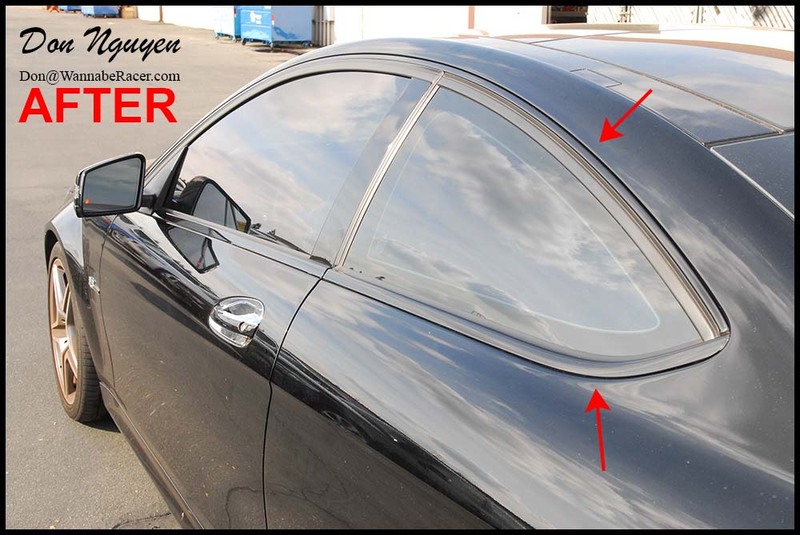 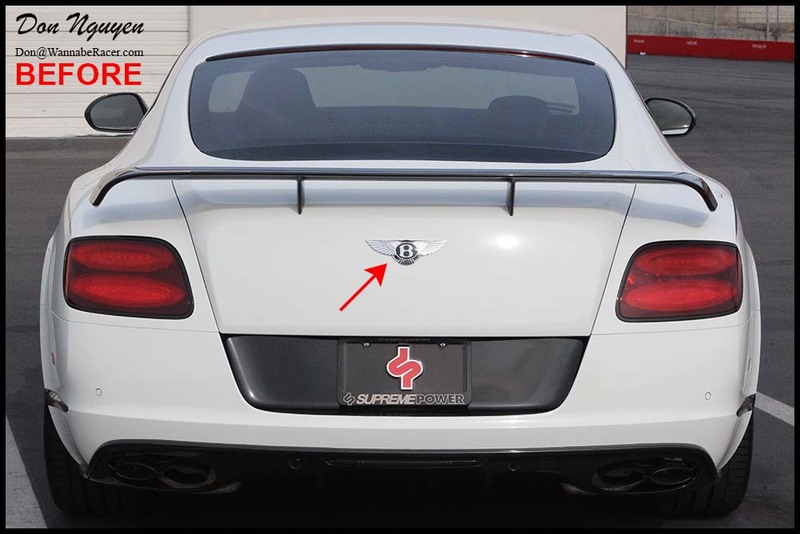 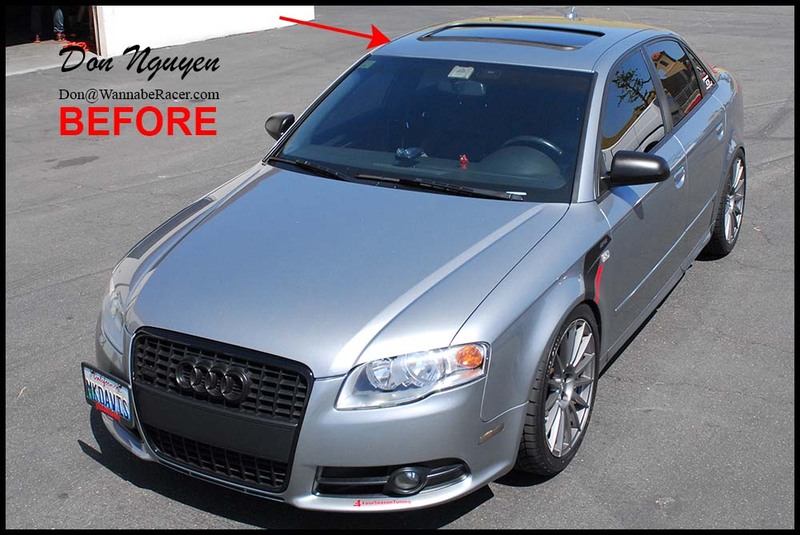 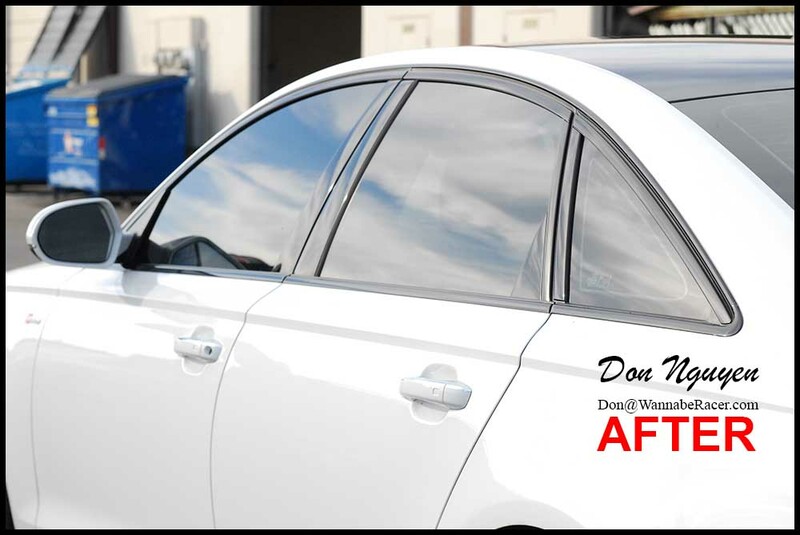 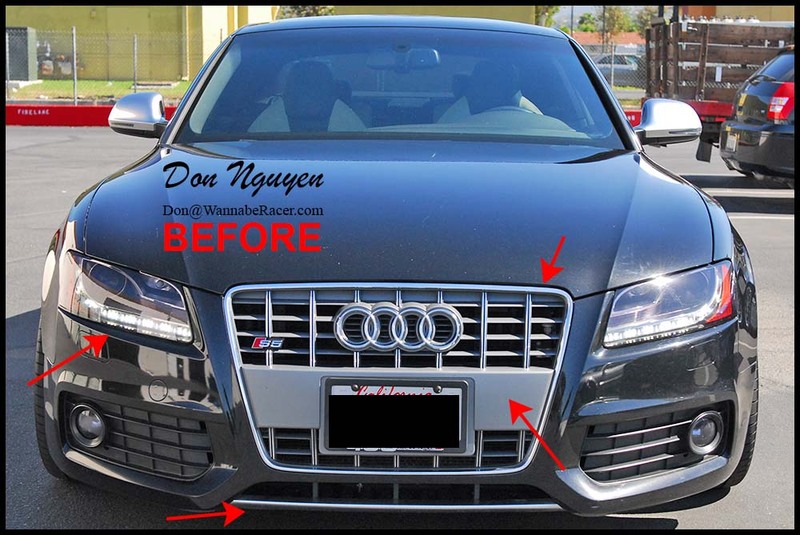 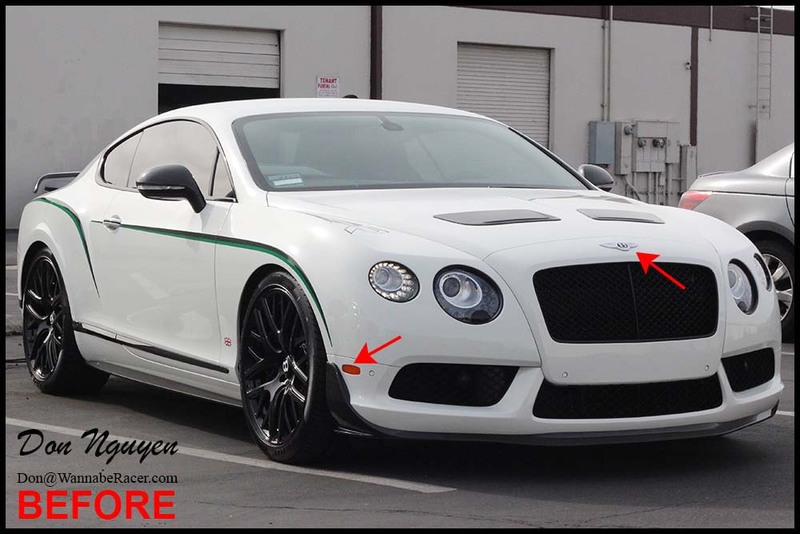 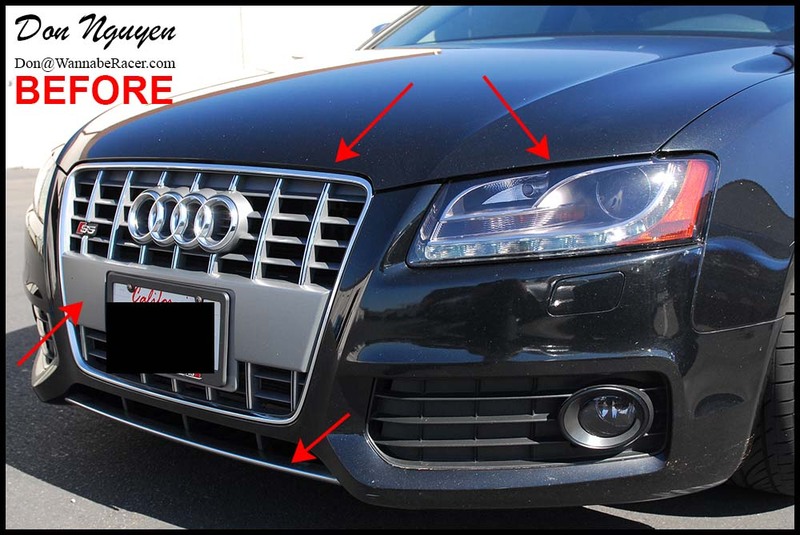 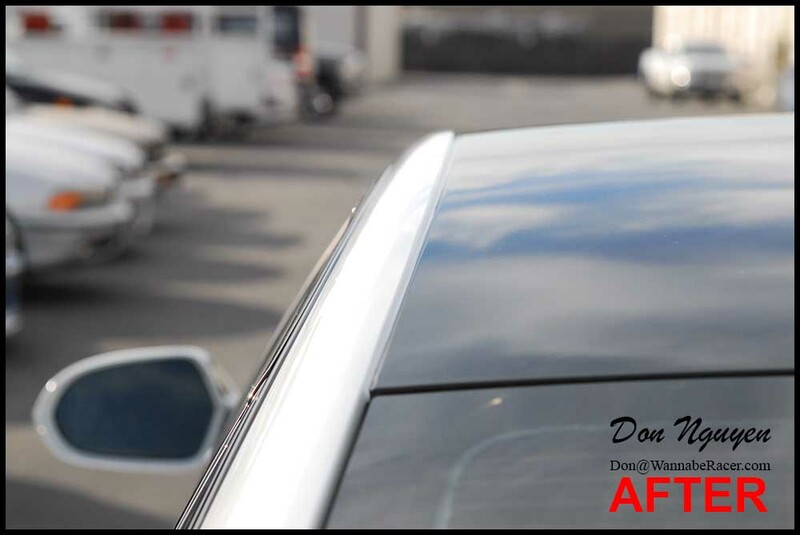 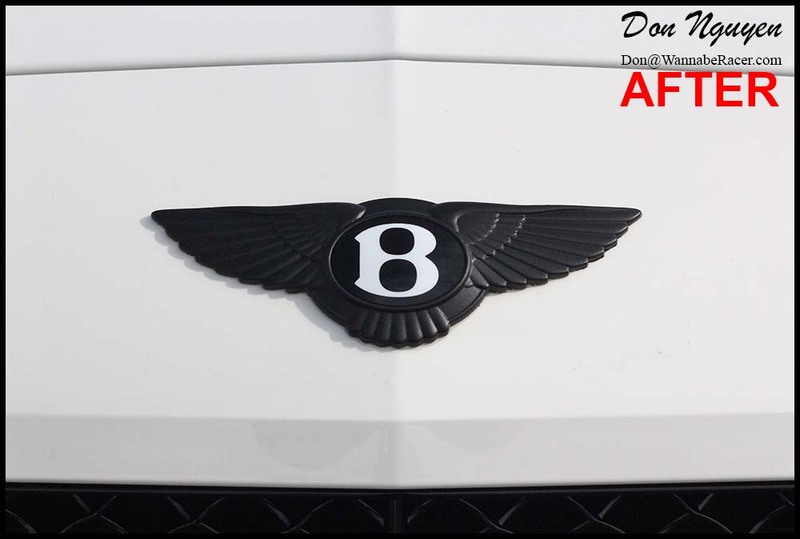 Most people usually say that most vinyl wraps usually look the best on white or lighter colored car, but that is not the case, especially when it involves wrapping or covering up the chrome trim pieces on a car. 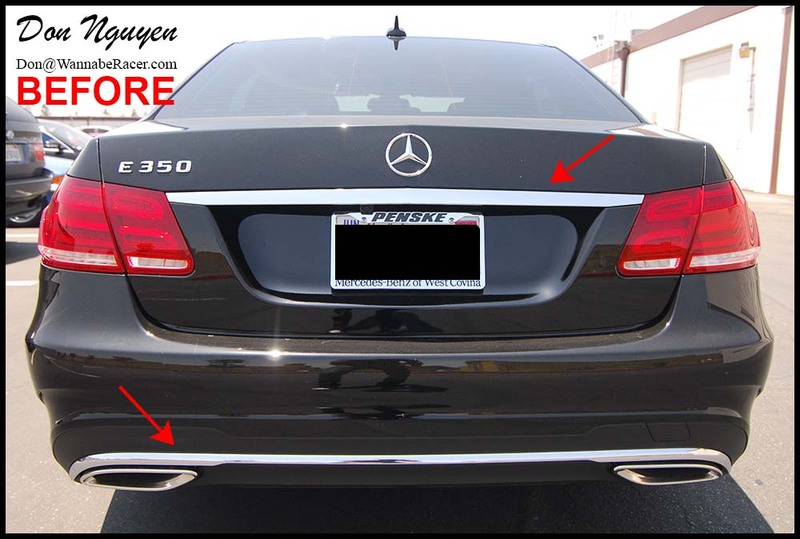 If anything, the chrome accents on the car probably stand out even more so on a darker colored car than a lighter one. 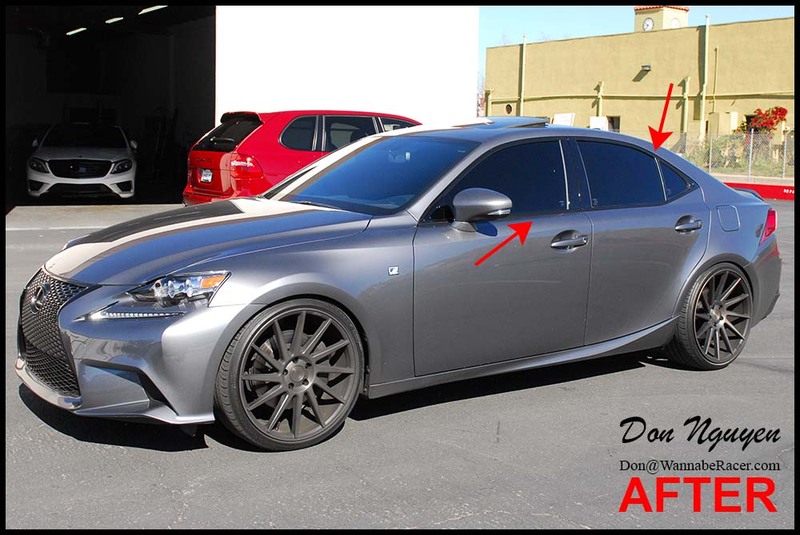 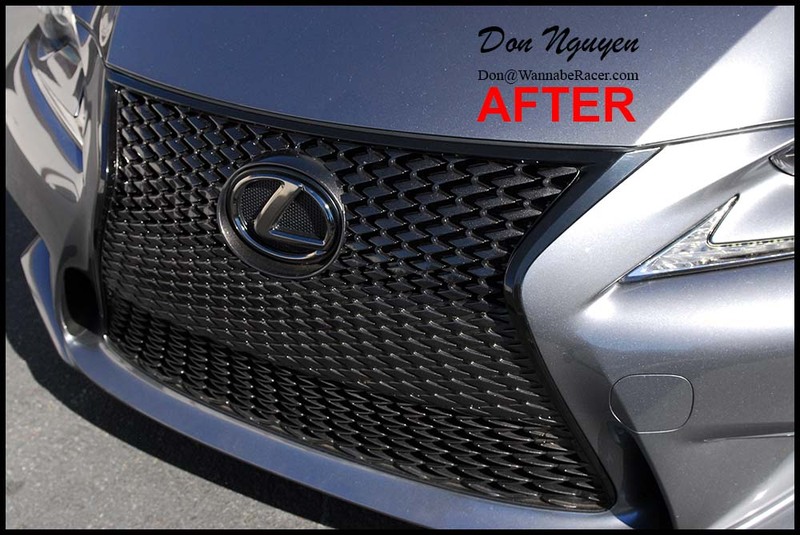 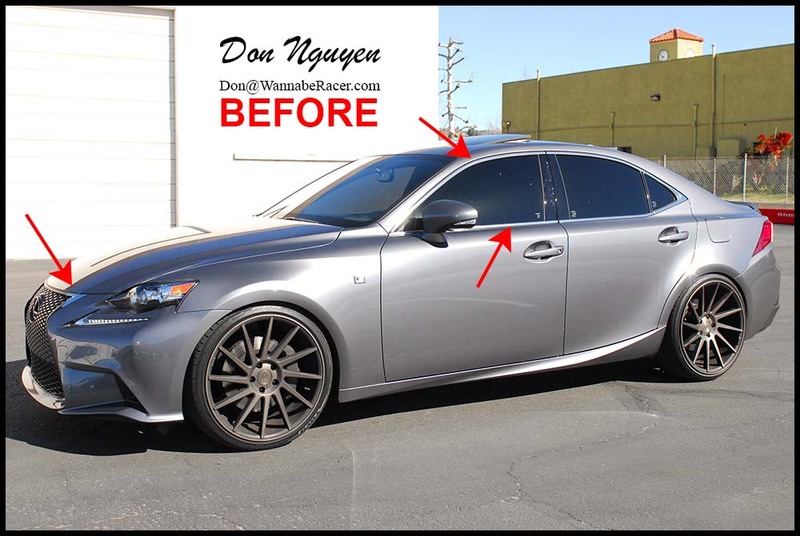 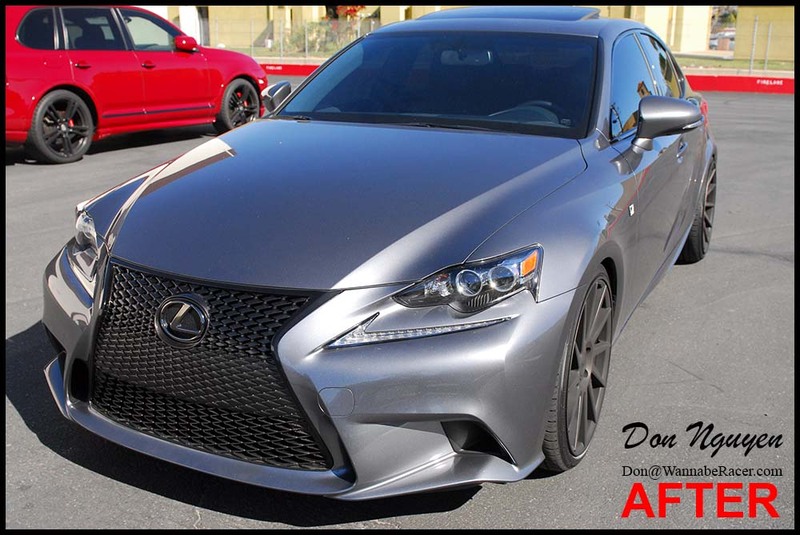 For this Lexus IS350 F Sport sedan, the owner had me vinyl wrap both the chrome window trim and front grill in my gloss black vinyl material. 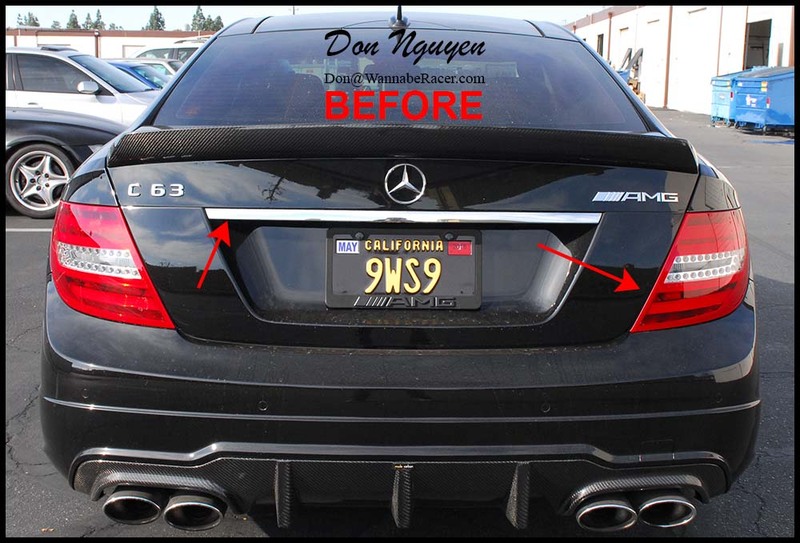 The owner of the car was from Riverside and came out to me in Anaheim Hills / Orange County to have the work done. 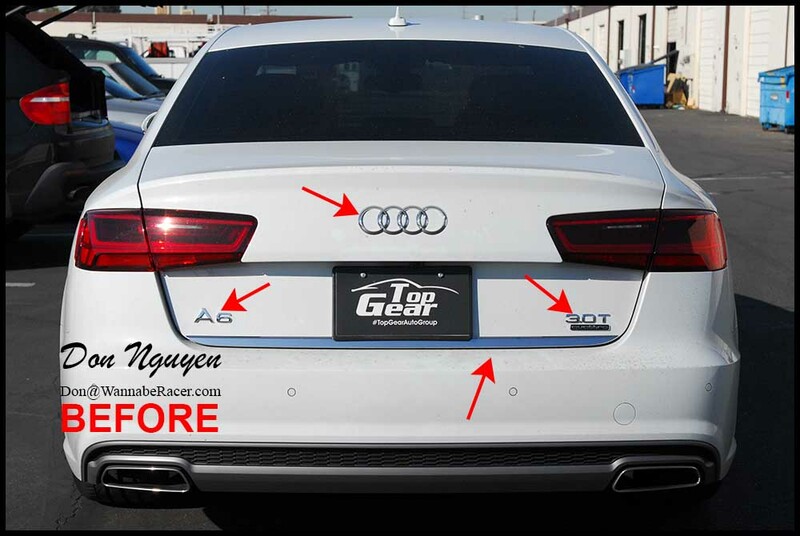 As you can see in the side by side before and after picture that I have back to back, the change is subtle, but still improves the overall look of the car quite dramatically. 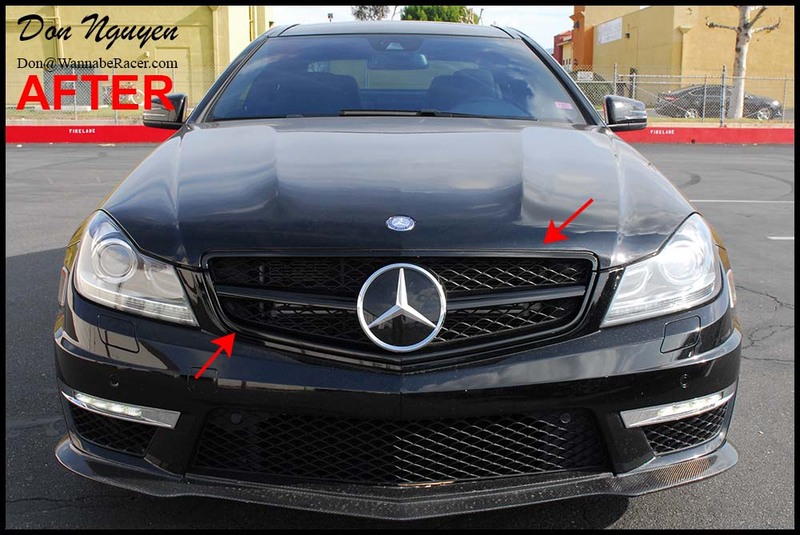 Mercedes, and even a lot of newer cars in general, have for some reason decided to add a constantly increasing amount of chrome to every next generation of car that is produced. 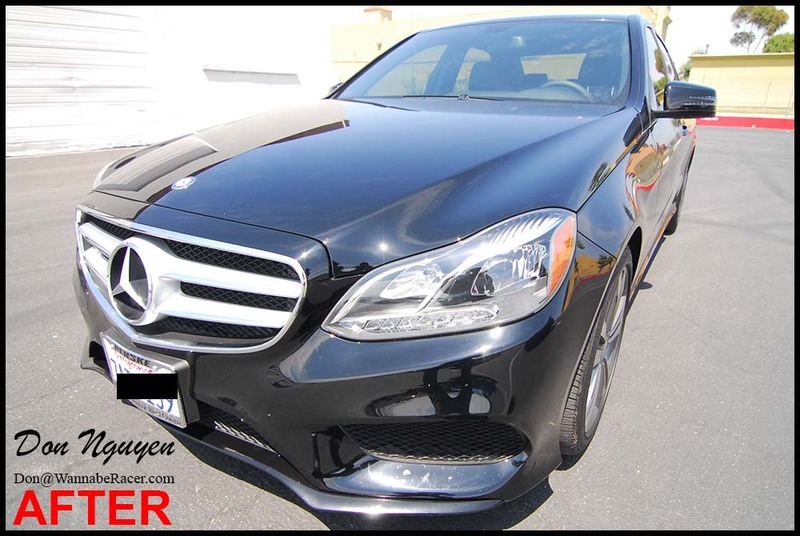 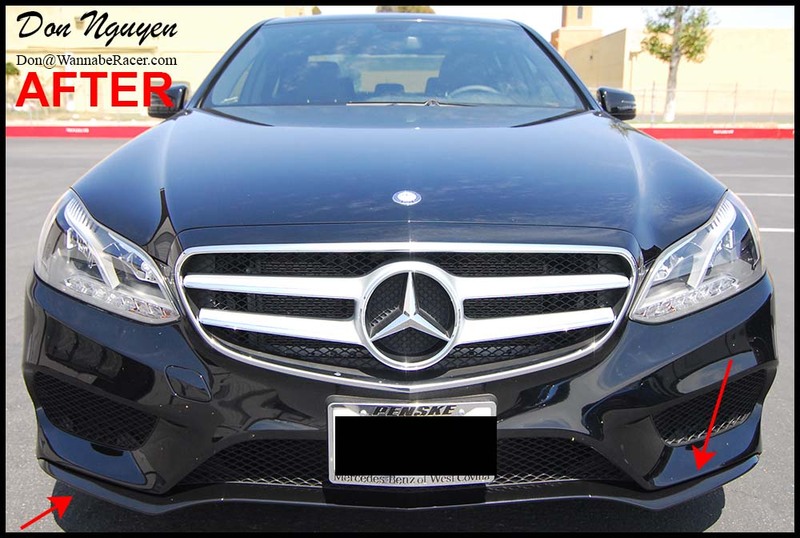 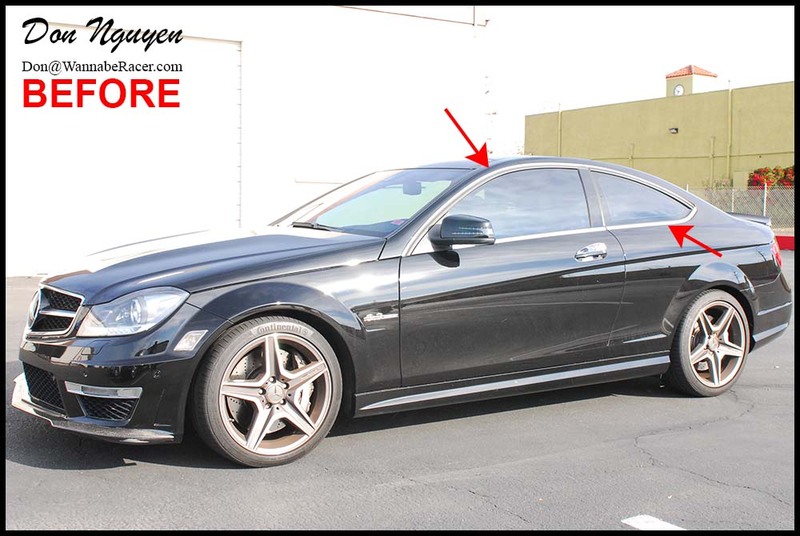 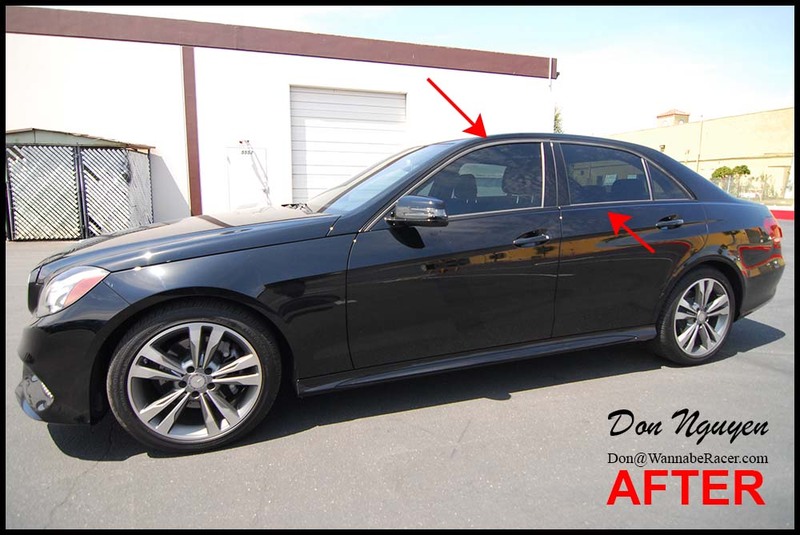 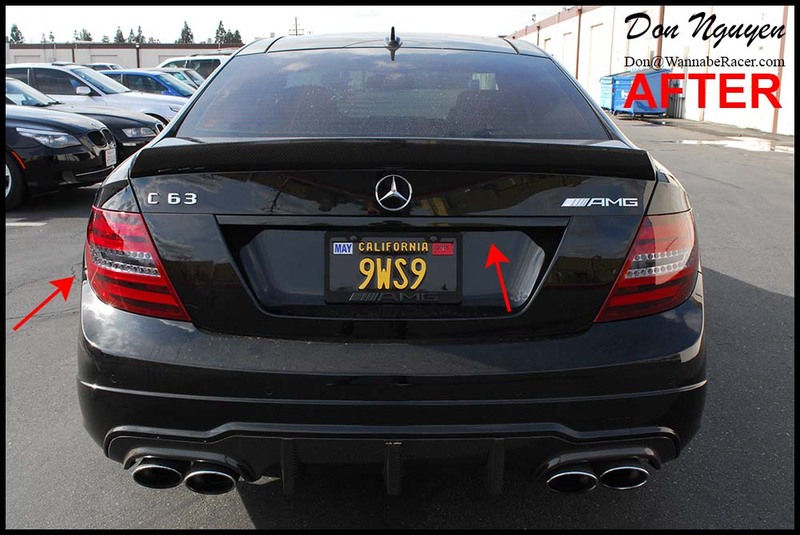 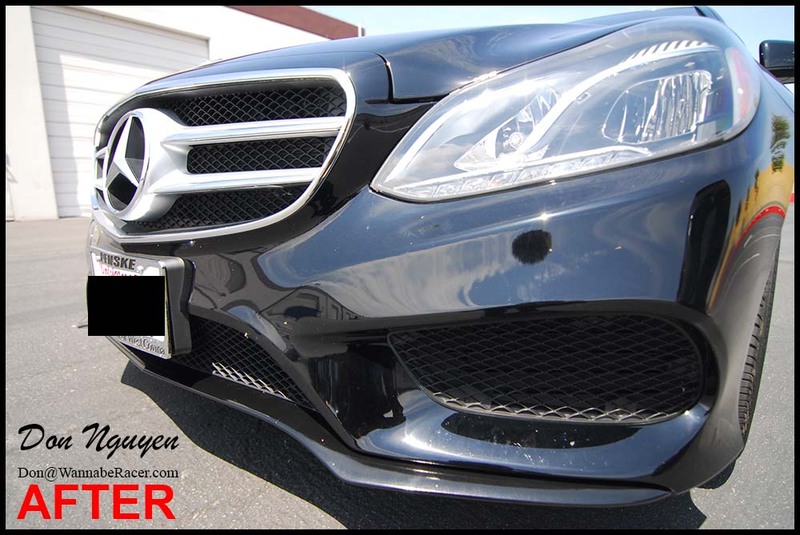 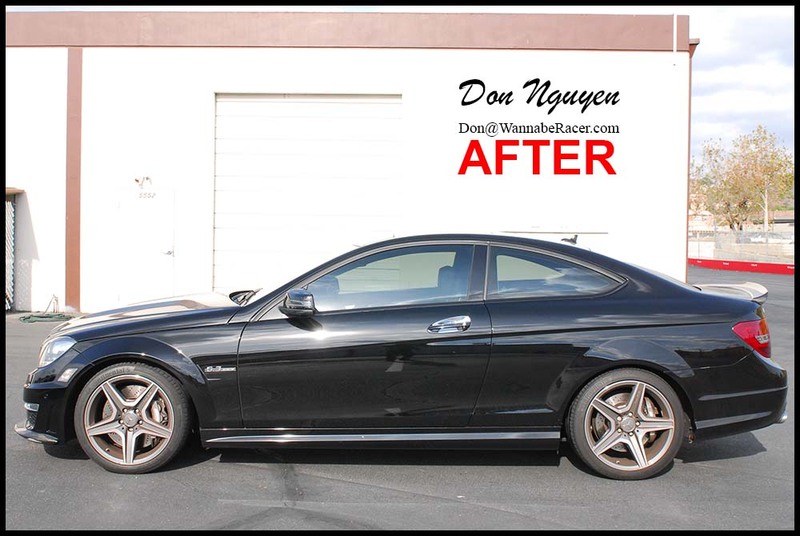 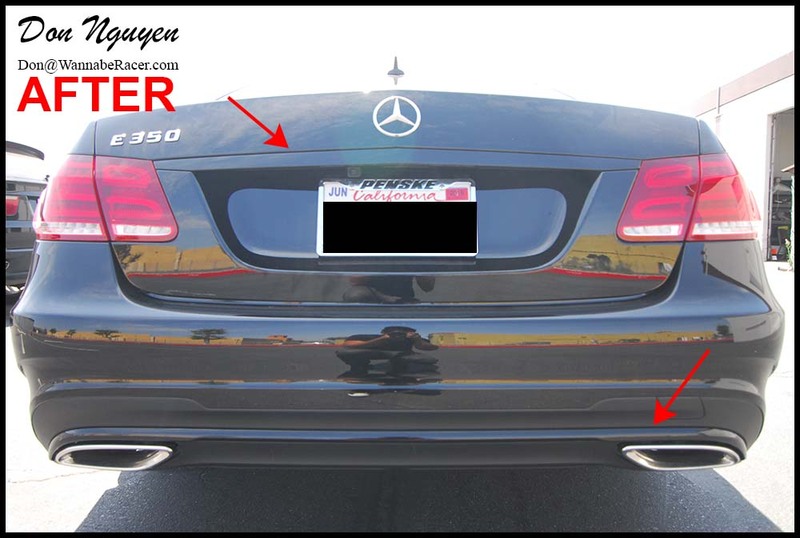 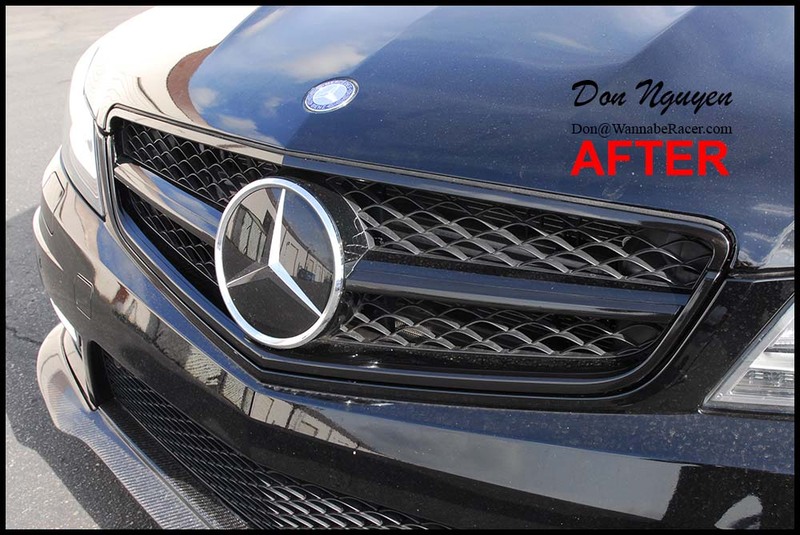 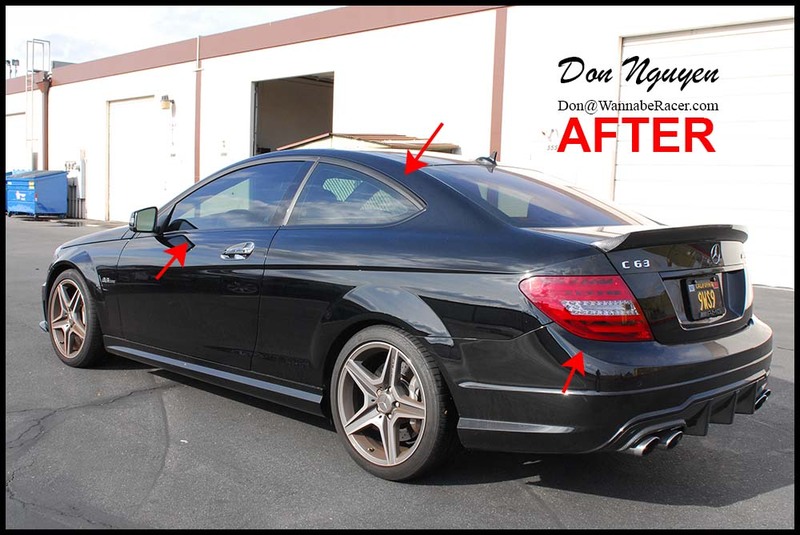 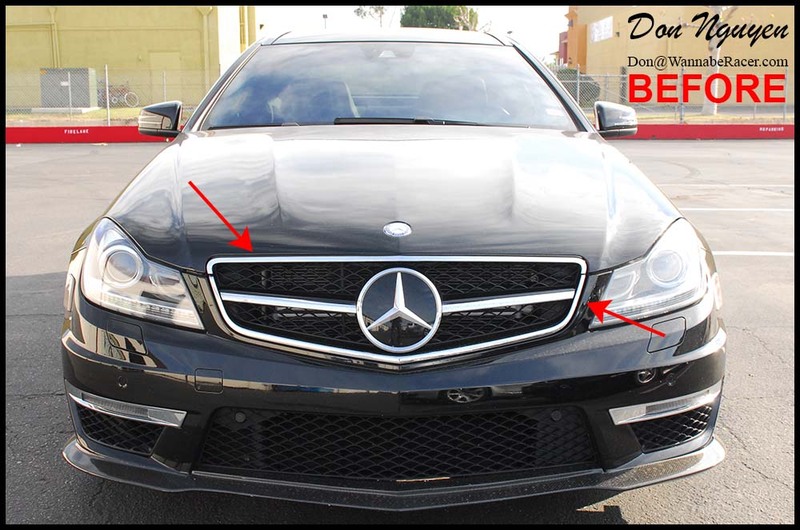 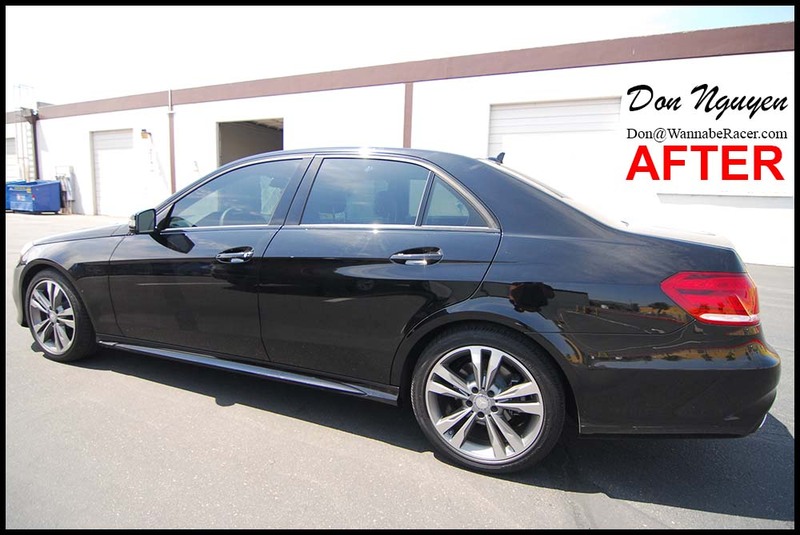 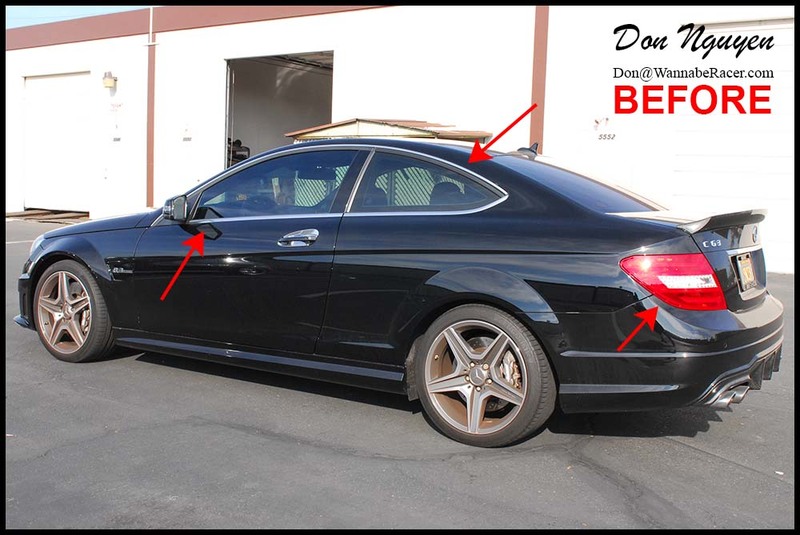 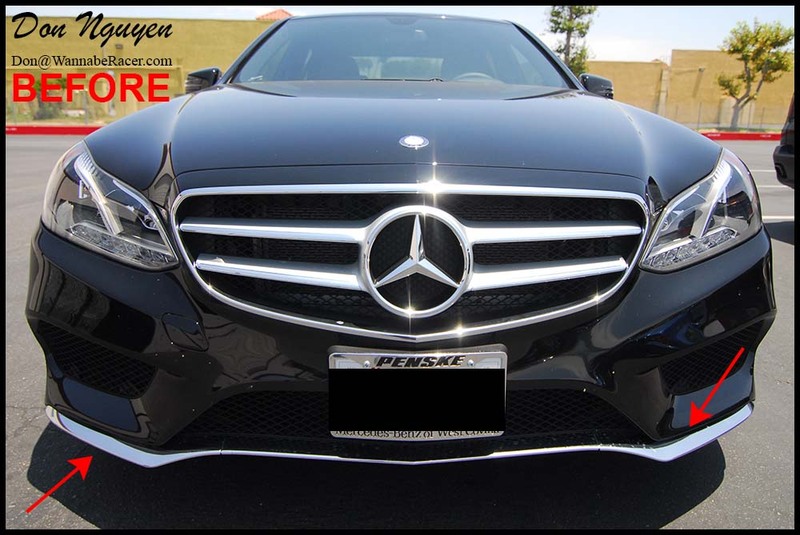 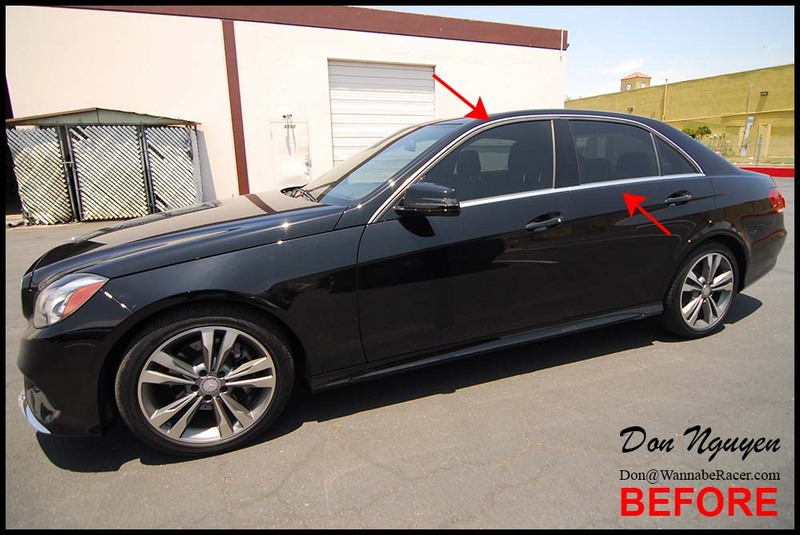 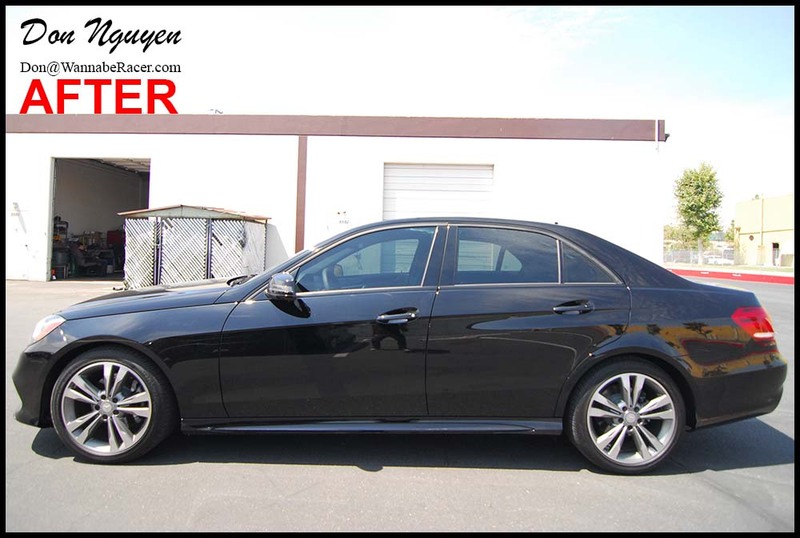 For this particular Mercedes Benz E63 AMG sedan, he wanted to have the chrome on the lower front bumper, side window trim pieces, rear trunk handle, and lower rear bumper chrome blacked out in a gloss black vinyl finish. 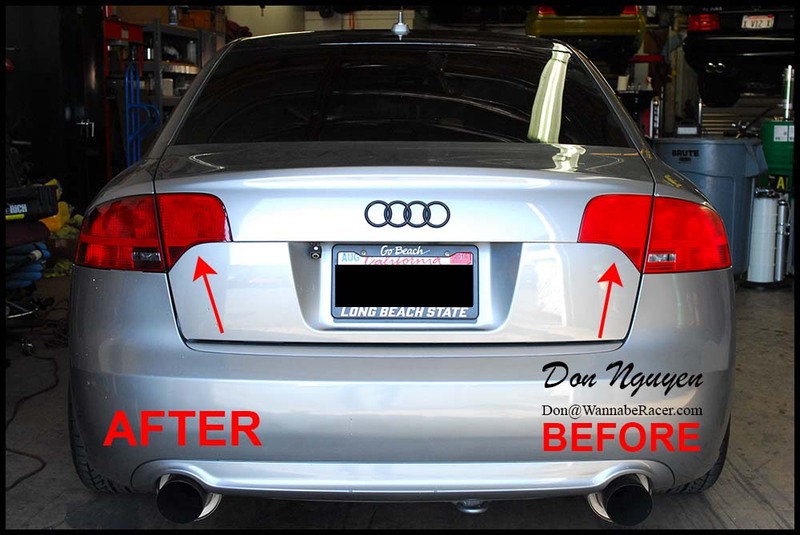 The owner of the car was from Inland Empire / Rancho and came out to me in Anaheim Hills / Orange County to have the vinyl car wrap work done. 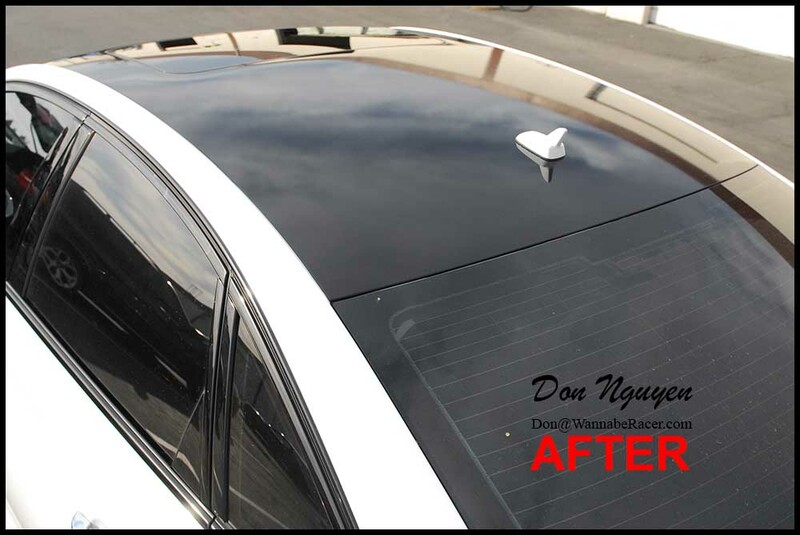 We didn’t completely black everything out and still left some chrome pieces on the car so that the car still retained some contrast. 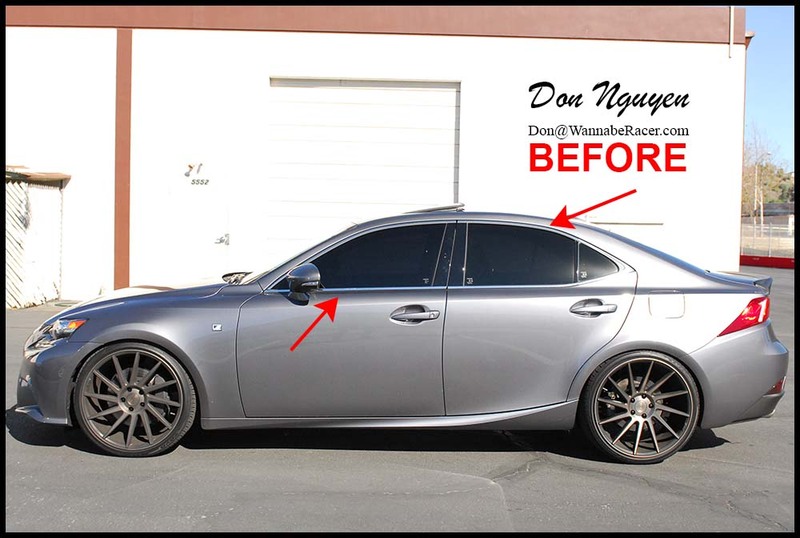 Sometimes wraps can allow for certain parts on the car to blend in better, while other times wraps can add contrast to a car in positive ways. 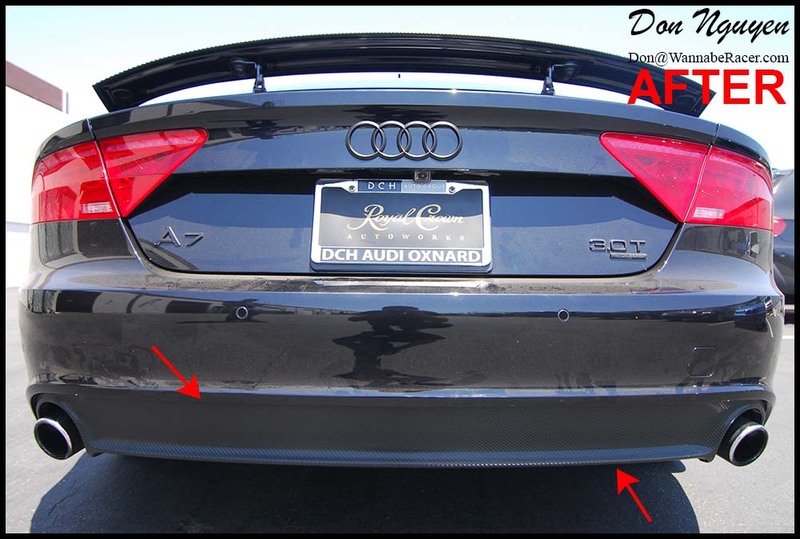 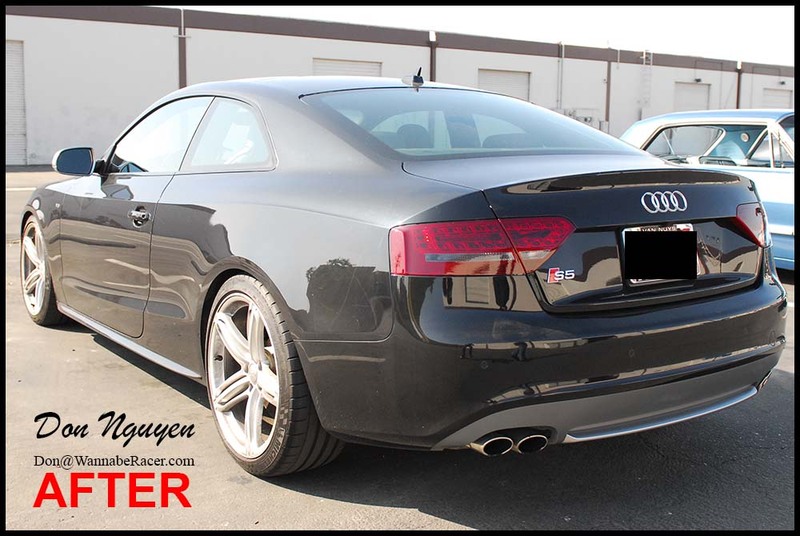 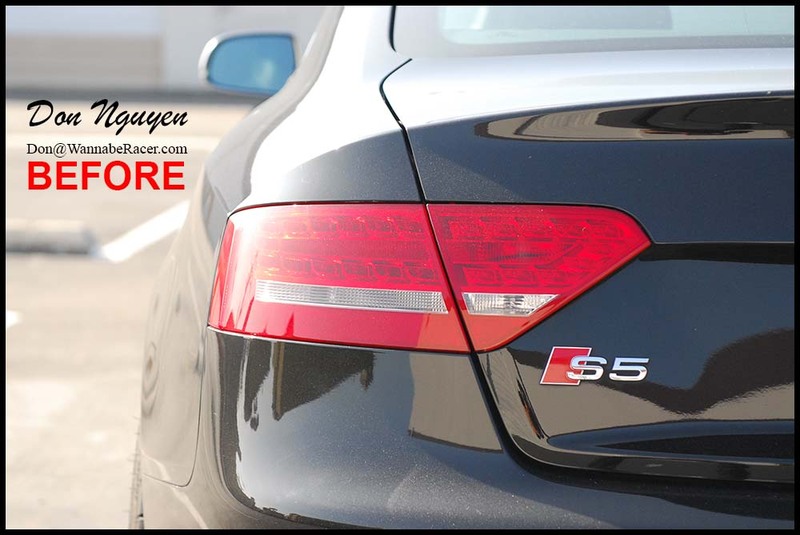 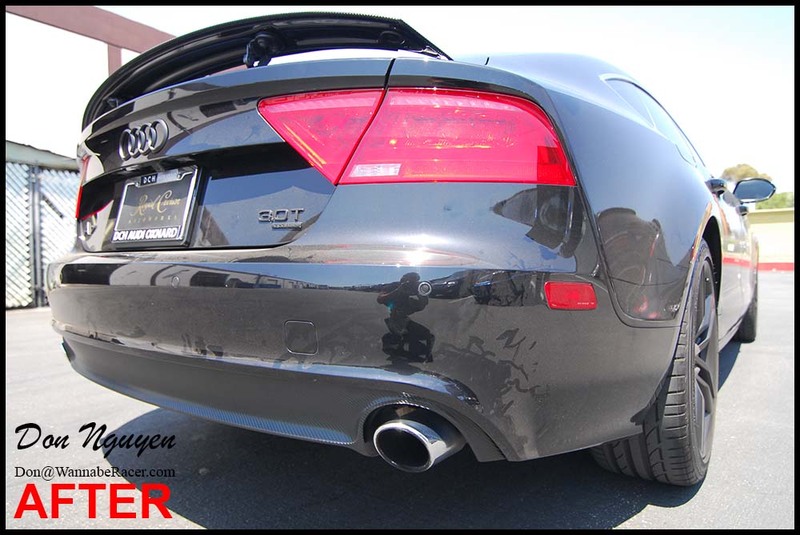 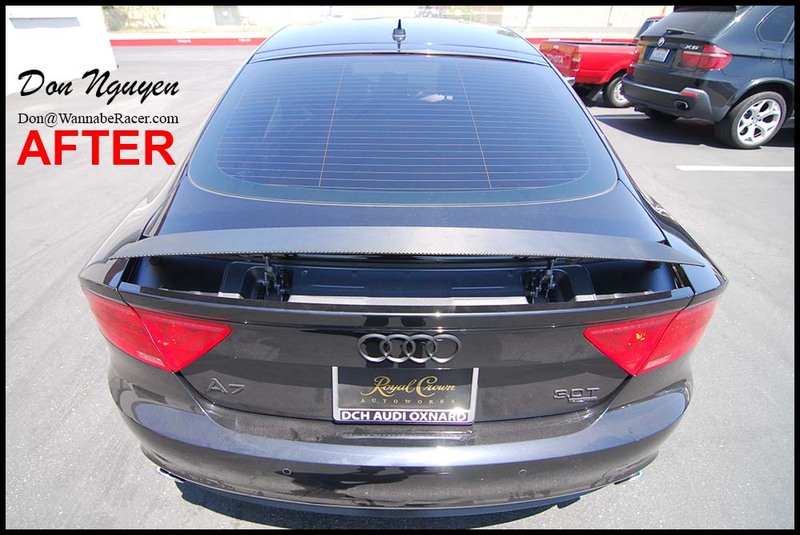 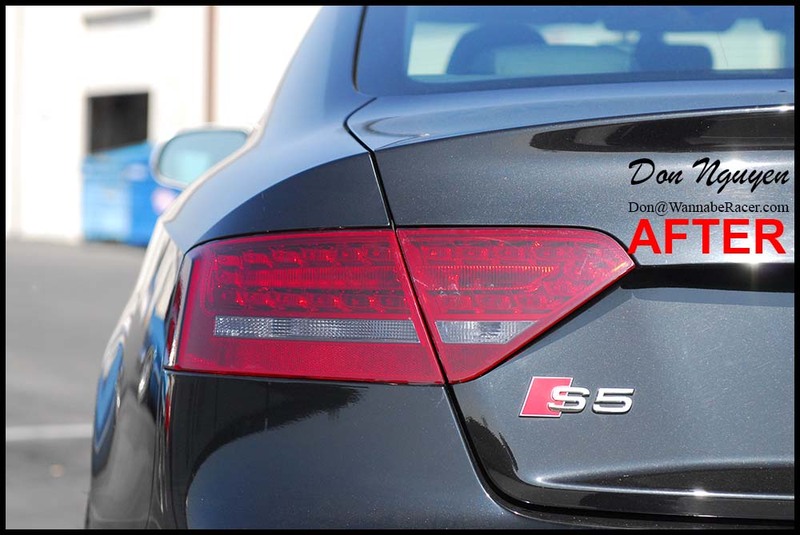 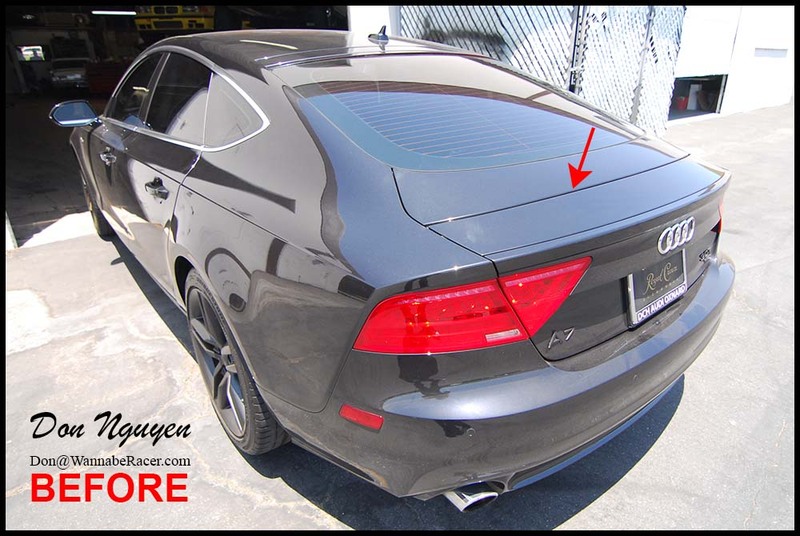 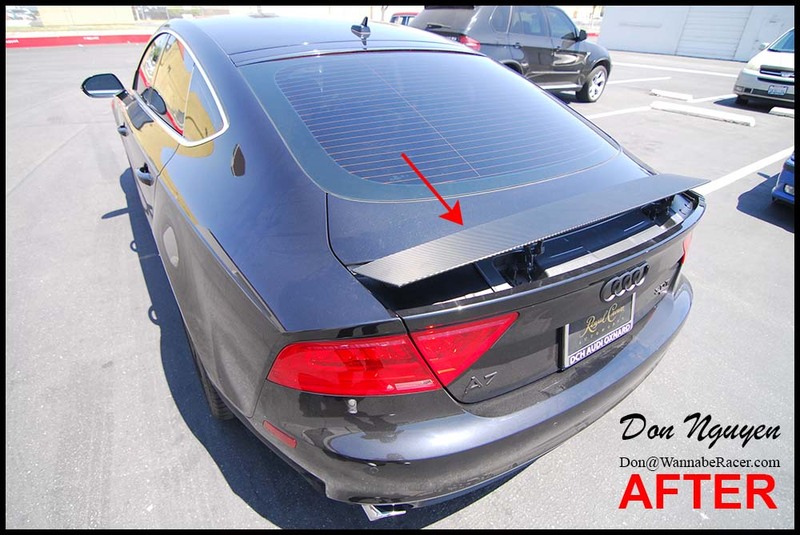 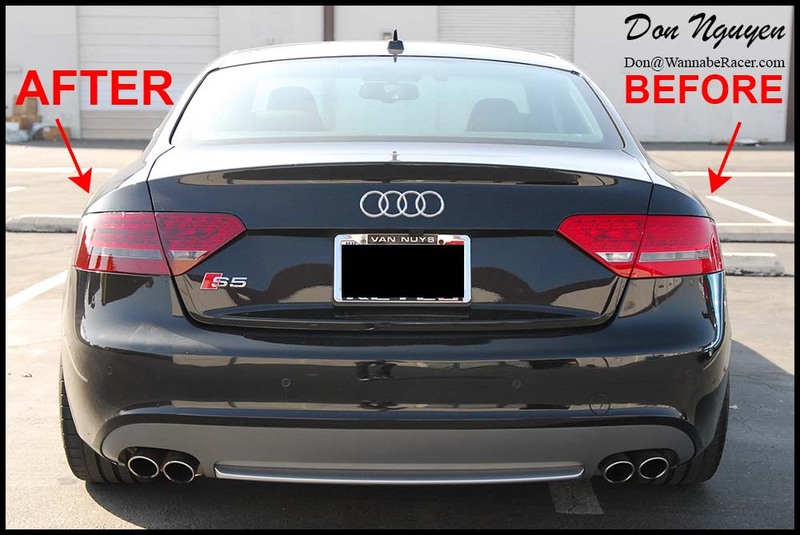 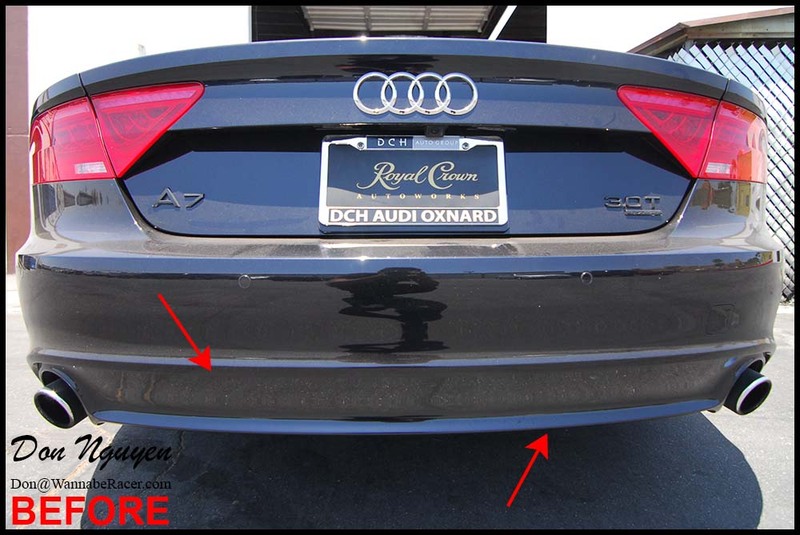 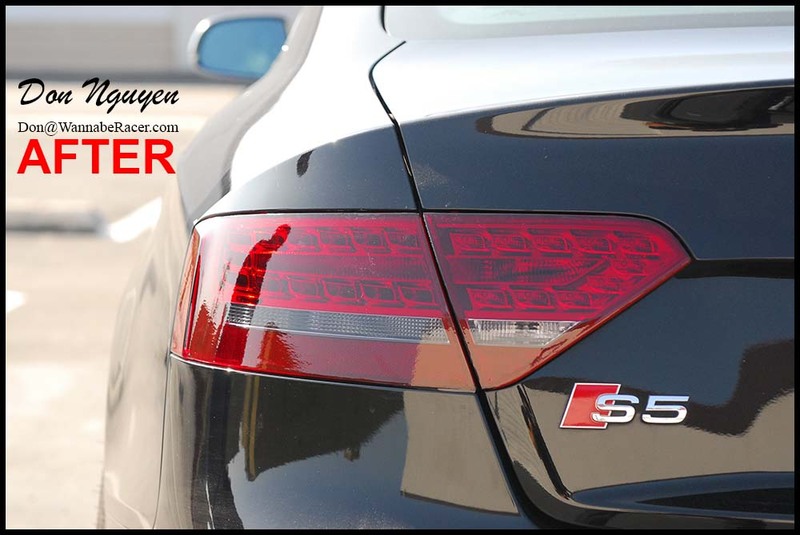 In the case of this Audi A7 sedan, instead of the typical blacking out of the chrome, etc, I ended up wrapping the rear integrated spoiler and lower rear diffuser in the 3M gloss carbon fiber vinyl finish. 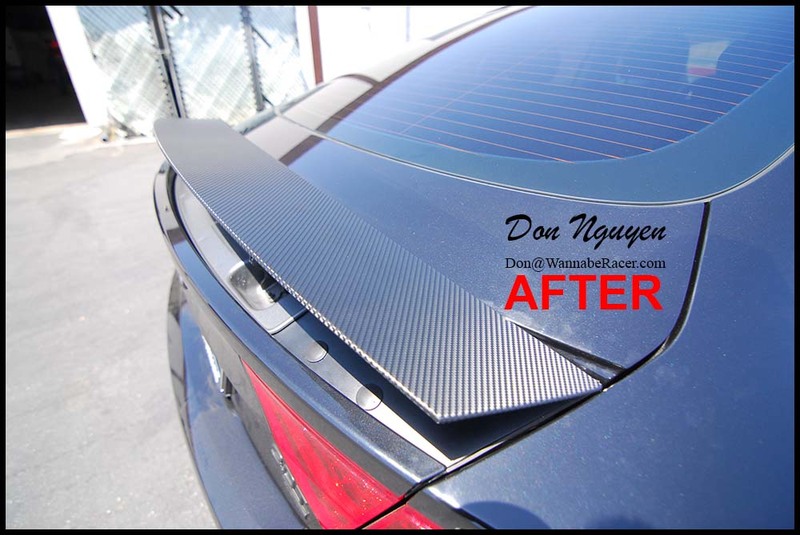 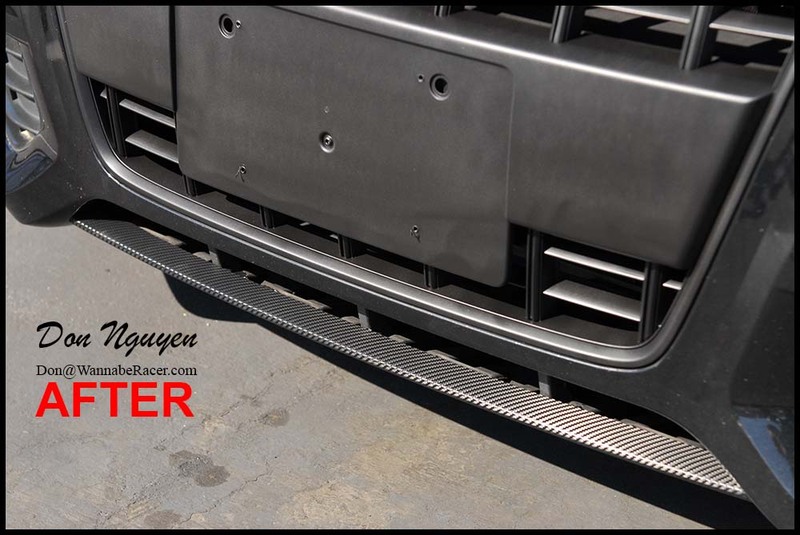 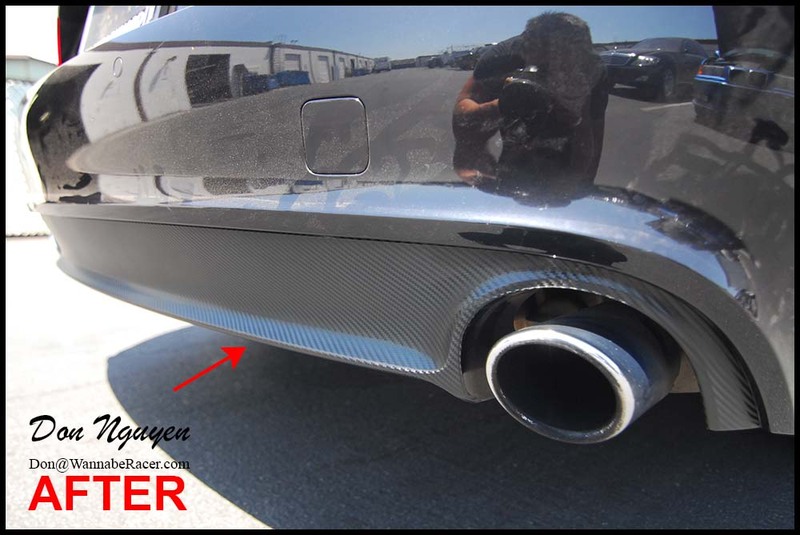 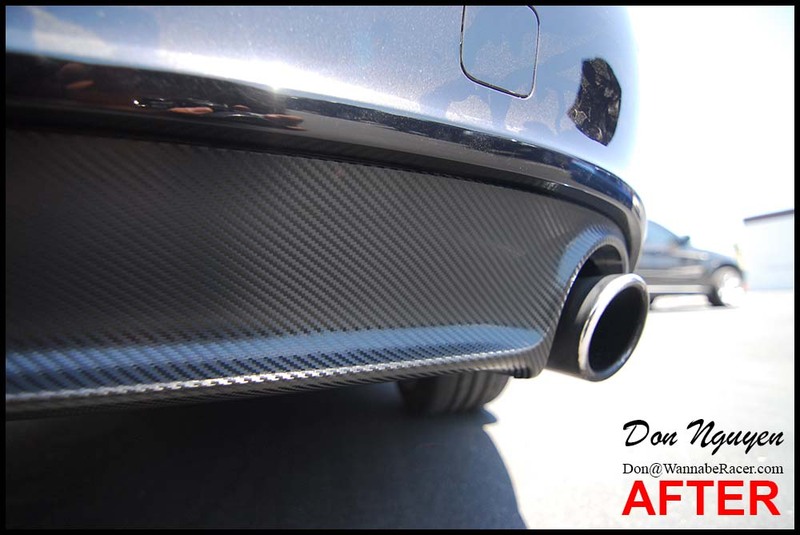 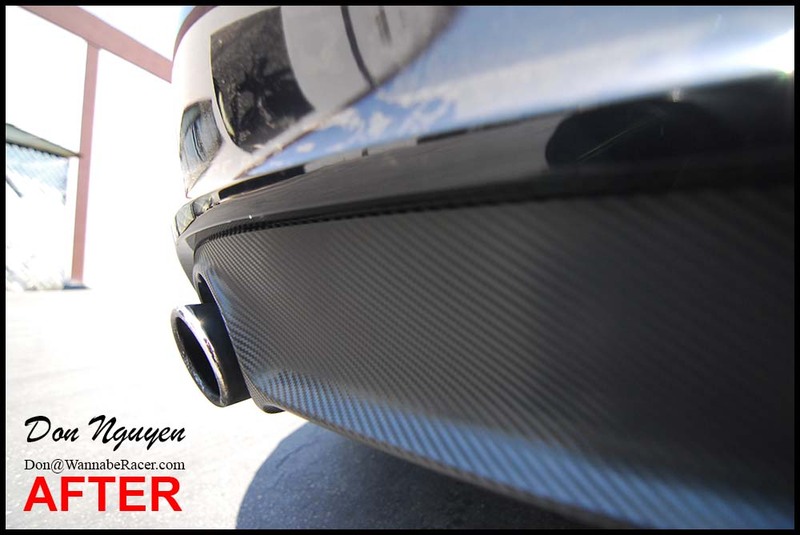 Since the car is already a dark color, the addition of these carbon fiber wrapped pieces still blends in with the car fairly well, but also still provides a noticeable contrast against the black color of the car. 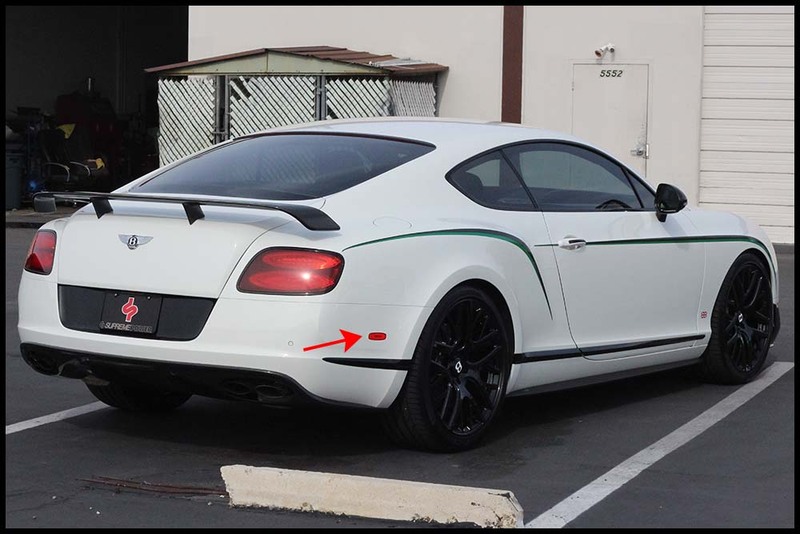 The owner of this car was from Pasadena / Los Angeles area and came out to me in Anaheim Hills / Orange County to have the vinyl work done.